Friday was my reward for a long week spent weeding and preparing the garden. I finally put out the first of our tender vegetables, plants that can't bear the frost and that will be coming up around the time of our frost free date. Reading straight off my spreadsheet, I ended up planting in alphabetical order --- basil, beans, cantaloupe, corn, cucumbers, garbanzos, okra, peppers, quinoa, summer squash, urd beans, and watermelon. Even tenderer plants will be hitting the dirt in a couple of weeks. 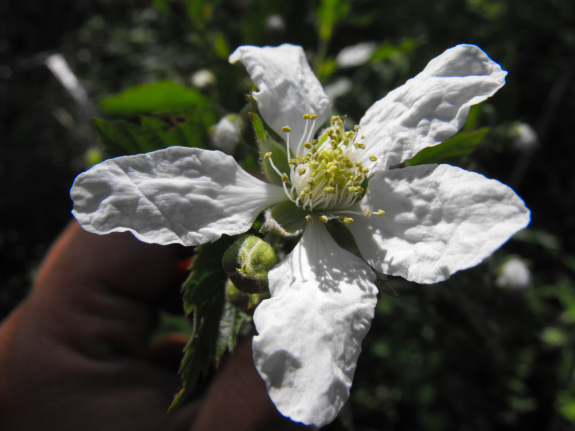 Even though the 80 plus degree heat wore us out fast, my Mexican sombrero let me keep moving long enough to slip some summer flowers into gaps in the forest garden. Last year, I finally threw flower seeds in the ground in June, and was stunned by how they brightened my day in October. Mark points out that with bees in our lives, it only makes sense to take a few minutes and plant flowers, so I raked back the mulch in a few sunny gaps and dropped in seeds of Mexican sunflower, pink and white cosmos, zinnias, marigolds, fennel, sunflowers of two varieties, a bumblebee habitat mix (thanks, Jennifer! ), and asters (thanks, Mom!) Except for the last two, these are tried and true flowers that bear my neglect admirably and bloom with no care from me. This is the first year we're growing garbanzos, and the seed packet confused me. 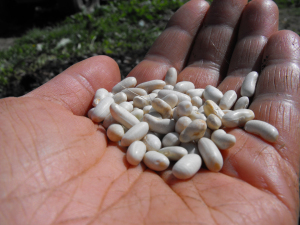 It told me that garbanzos are a cool season crop like peas, and then combined that with an admonition to plant them after the frost free date. Um? Has anyone grown them? When did you plant them? With hot weather on the horizon, now's the time to give your chickens an automatic chicken waterer and make sure they never run out of water. 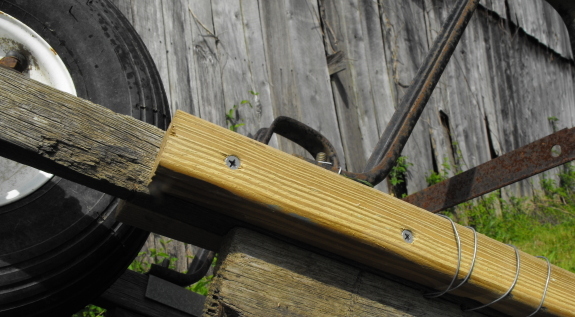 Don't forget to drill pilot holes through the wheelbarrow frame and the new 2x2 handle. I placed another section of 2x2 on the other side with a pilot hole only half drilled to give the new screws something to bite onto without splitting anyone's grain. So you lost your bet on the Kentucky Derby? Don't despair --- we're holding a betting contest you're much more likely to win! And this one is chicken related --- aren't chickens better than horses? 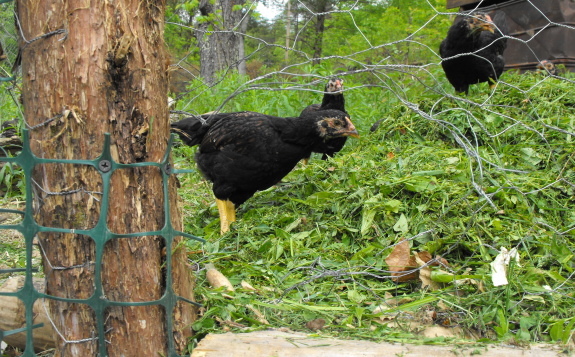 If you're interested, you can read about our plans for creating several rotational pastures for our broilers, complete with food-bearing perennials. We'll be rotating our chickens through future pastures every couple of weeks so that they don't demolish the vegetation, but we want them to scratch this first pasture up pretty good so that we can sow it with grains for their winter diet. When will the ground become bare enough to plant in? For the scientific minded among you, here's some more data to help you choose the very best date. 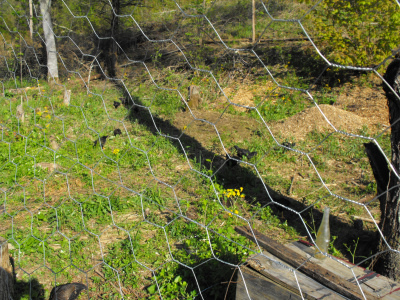 Our chicken pasture is about 800 square feet and holds 25 birds who will be six weeks old on Monday, May 3. They've been eating at the pasture since April 23, and have already started to scratch their most traveled spots bare. On the other hand, they have been concentrating their attention on less than half of the area so far and haven't really found the far corner yet. I've been adding wheelbarrow loads of weeds every few days, and am feeding them about a gallon of food a day. (They're hungry little birds!) All of the photos in this entry were taken Friday and are relatively representative of the pasture at this moment. It's built around a big wild cherry that is starting to leaf out, so the vegetation is weeds that do well in partial shade, not grass. The fine print: The ground will be considered bare enough when I randomly decide it's bare enough. Only one guess per person, please! Permaculture chicken operations go hand in hand with our homemade chicken waterer --- it never spills or fills with poop, so your chickens are happier and healthier. Sometimes an old fashioned shovel beats out a fancy roto tiller. Big, thick, Poke root extraction is a task that needs someone to invent a solution for in the form of a tiller like machine. Maybe it will somehow use a small, flexible auger to chase down and grind up any unwanted roots within a 4 foot deep perimeter? Hopefully it'll be easier to start up than our tiller was last year. This beautiful mushroom popped out of the half-buried log bounding one side of our three year old peach raised bed. I've been piling weeds and dirt along the sides of the raised bed every year, but was a bit concerned that the peach roots would get stuck inside and not make it out into the surrounding soil. Clearly, some fungi are hard at work breaking those logs down into prime compost and clearing the way for the peach roots' expansion. 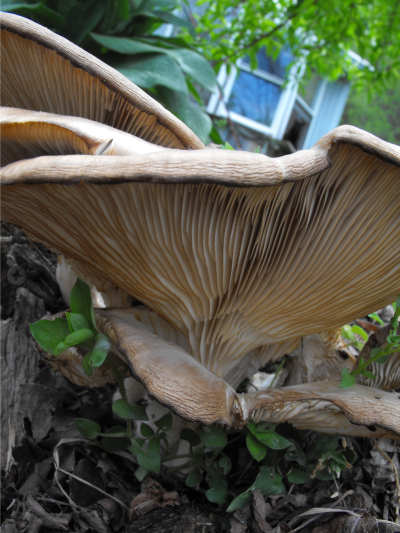 For a few minutes, I thought this might be a wild oyster mushroom, enhancing the edibility of our forest garden. But my best guess at the moment is Smooth Panus (Panus conchatus), a relative of the oysters, but one which has edibility listed as "tough but apparently harmless." I guess I'll let the mushroom work in peace, although I'm tempted to harvest the dozens of insects hiding in the gills for chicken feed. Our homemade chicken waterer provides POOP-free water for your flock. The recipe is mixed by volume and results in a fertilizer with NPK of 5:5:1, along with substantial amounts of the most important micronutrients. Solomon says that not only does complete organic fertilizer result in balanced nutrient levels in the soil, it is also easy for beginning gardeners to deal with and doesn't require hauling so much bulk to your farm. I was leery of the price tag attached to Solomon's mixture, but he says that the ingredients are relatively cheap when purchased at feed stores. 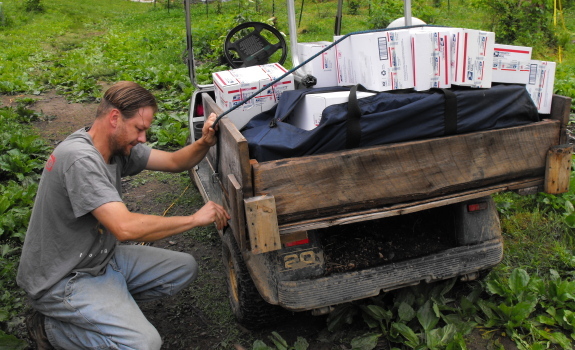 He spends about $300 per year buying the components, and gets $4,000 to $8,000 worth of vegetables in return. Solomon uses a gallon to a gallon and a half of his complete organic fertilizer on every 100 square feet of garden, then adds the same amount again as side-dressing on his higher demand vegetables. 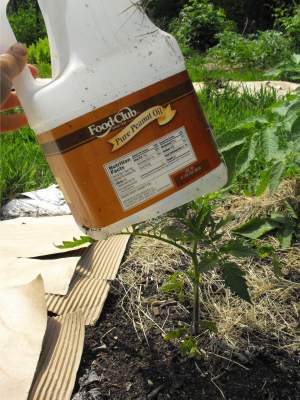 This fertilizer is in addition to a quarter inch coating of compost added to the garden each year. The price tag is still considerably higher than buying enough compost to reach the same fertility level. Complete organic fertilizer doesn't add much organic matter, which is a definite problem if you have a clayey garden like mine. Lime should be used with care when gardening over limestone, the way we are. 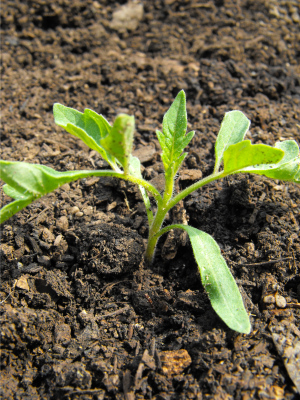 Your soil will probably already be somewhat alkaline and may be very high in calcium and magnesium. Do a soil test before adding any lime! All of those warnings aside, I suspect some of you might like to give complete organic fertilizer a shot. If you do, please check back and let me know how your experiment went! Stuck in a cubicle? Work your way free with Microbusiness Independence. How much land do I need to grow all my own vegetables? Thanks goes out to Roland for pointing me in the winch/tripod direction for any future heavy root extraction. 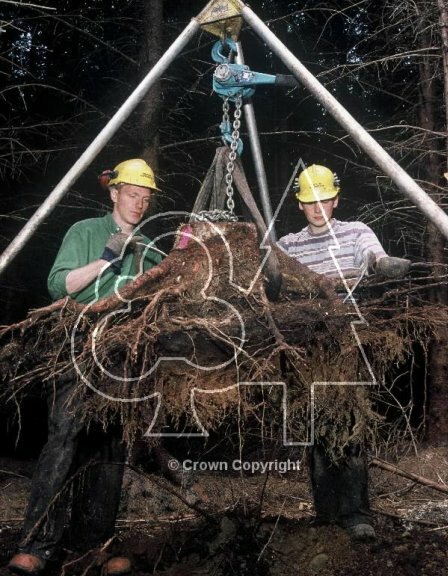 With any luck our Poke roots won't get as big as this Sitka Spruce root in Scotland. I woke to the sound of rushing water --- the floodplain is submerged. A scuffle in the hallway --- Huckleberry caught a mouse. 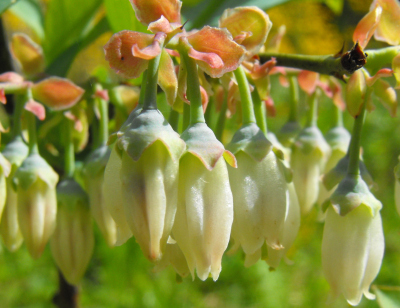 Blueberry bushes are coated in hundreds of flowers, some starting to open. 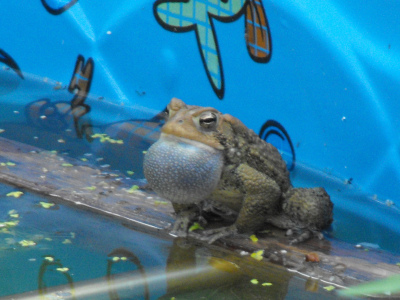 Seven male toads beckon lovers from our mushroom soaking kiddie pool. Tiny fuzzball peaches are swelling fast, now bigger than my thumbnail. 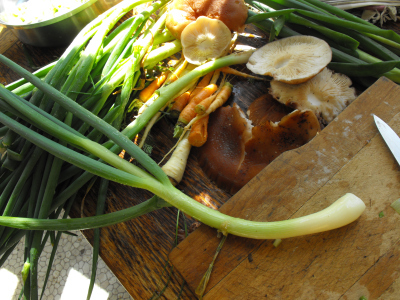 Stir-fry for dinner --- dozens of Egyptian onions, some overwintered carrots and parsnips, and shiitakes sodden from three plus inches of rain. The first lightning bugs danced in the dark. I hope your spring days are as sweet! Spring means chickens. Prevent the filth this year with a homemade chicken waterer. How do large logs get moved on a remote log cabin construction site that has no power or heavy machinary? Gas powered winch of course. The one on the right will cost you about 800 bucks and hooks up to most chainsaws. The bigger one comes with it's own engine and will run you over 1300 dollars. A good equipment rental store might rent these out for around 50 bucks a day, which would be well worth it if you're trying to carve out a log cabin structure in the middle of nowhere. That style of building would qualify as extreme homesteading in most people's book. Ever since I read that traditional Guatemalan farmers use young elderberry leaves as mulch around their vegetables, I've been aching to give it a shot...and to figure out why they focus on elderberries rather than on other trees. The answer to that question may be a combination of early leafing, compound leaves that are easy to pull off the trunks and quick to decompose, and elderberry's inherent resilience. I've been mowing over some elderberry sprouts in the mule garden for three years now, and they just keep coming back up (and spreading), so I'm not concerned that I'll harm my shrubs by pulling off a few leaves. Tuesday I decided to strip the patch of elderberries by the barn as part of my neverending search for more mulch. The big leaves broken off quickly and easily --- if I had a good-sized plantation of elderberries, I might not need any other source of mulch. After I ran out of elderberries, I moved on to the box-elders that are still sprouting up from stumps along the garden edges. These leaves took longer to harvest, but not by much. I just closed my gloved hand around the base of a small branch and pulled my way to the tip, stripping off all the leaves in my path. The result is a little bin of leaves that densely covered a couple of raised beds. Our homemade chicken waterer keeps poop out of your flock's water. At the moment, it looks like my eventual solution to the weeding problem will be to try to keep my beds under a near permanent mulch rather than spacing the plants far enough apart that they can be hoed. But Solomon is very anti-mulch --- disturbing since he's been spot on about so many other things. Maybe mulching isn't such a good idea after all? Solomon lists half a dozen disadvantages of permanent mulching. 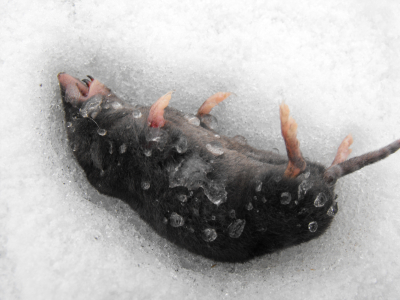 His biggest gripe is the "plague levels of small animals" that move into the mulch if you don't live in a cold enough climate. I assume he's talking about moles and voles and shrews here, and I feel extraordinarily lucky that Lucy is a small animal killer and doesn't let any of these survive in our garden. Solomon's other arguments against mulch don't carry as much weight with me. He notes that if you use hay, you end up with a lot of weeds --- so don't use hay. 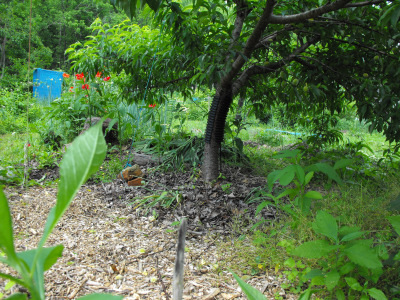 If your summers aren't hot enough or if your mulch is too woody, it won't rot into the bed before summer and will tangle with your hoe --- but you shouldn't need to hoe much if your bed is well mulched. Mulched garden soil is slower to warm up in the spring than bare earth --- so rake the mulch off a few weeks before you need to plant your earliest crops. He thinks that adding too much compost or mulch to your soil will result in soil nutrients out of balance, which will make your food less nutritious --- so use dynamic accumulators to reachieve that balance. Proponents of mulch argue that the practice conserves water, but Solomon makes the legitimate point that most water lost from the soil comes out of plant leaves, not from bare soil. He points out that mulching only keeps the soil surface moist and doesn't reduce overall moisture loss. On the other hand, I would argue that mulching does prevent soil crusts from forming (something that Solomon considers a big problem in his garden) and allows more water to soak in rather than running off in clay soil. I suspect that overall, mulch results in a net gain of moisture for the plants in our garden. So far, our experiments with mulch over the last year have been highly successful, but I'll keep all of Solomon's arguments in mind and will be willing to give up on mulching if I start to see major disadvantages. Learn to pay your bills by working only a few hours a week. A solid 25 pound brick of chicken yummyness was acquired in the big city today for about 13 bucks. Stay tuned for a full report on how the new chicks respond to the Purina Flock Block. Our beekeeping mentor (aka our movie star neighbor) called to remind me that the first major nectar flow of the year is about to begin. "The Black Locusts and Tulip-trees are starting to bloom," he warned. "Be sure to put an extra super on your hives!" 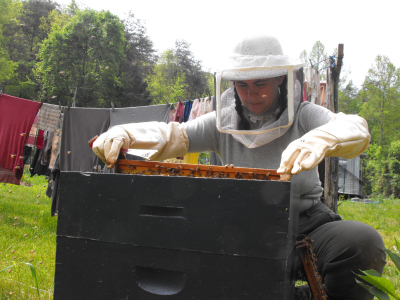 So I suited up and headed out to check on our honeybees. Although the nectar trees are blooming at our mentor's nearby house, our shady farm is a bit behind and the bees were miffed at my intrusion into their lives. Nevertheless, I was able to see that all three hive bodies were full of brood and pollen, and that one of the hives had filled the first super and started on the second. I popped a third super on our strongest hive, remembering with a smile how one beekeeper I met told me that he likes to add plenty of supers to a hive. "It can't hurt," he said, "And everyone passing by will think you must be an amazing beekeeper to need room for so much honey!" At the other extreme, one of our hives was down to its last small frame of honey. The queen in this hive started laying about a week later this spring than the queens did in the other two hives, and I suspect it's just taken the late queen longer to raise enough workers to sock away honey rather than consuming it. I'll check on them again next week and give them a bit of spare honey if necessary. Our homemade chicken waterer was highlighted on a local radio station this week! I'll keep you posted and give a link when the show is up on their website for remote listening. So, every fifth day, I need to add 1.5 inches of water back to the soil. My father, who lives in the hot and humid zone too but has sandy soil, may need to water every day or two but will add less water each time. Of course, to maintain a perfect watering schedule, you need to keep track of weather conditions. On cloudy days, the soil doesn't lose much water, so you can wait an extra day to water. When it rains, the amount of precipitation can be added back into the soil's supply, putting off watering even longer. As further evidence that Steve Solomon and I are on the same wavelength, Gardening When It Counts gives the same irrigation advice I do --- buy high quality impulse sprinklers and ditch the trendy drip irrigation. Solomon notes that drip irrigation equipment is expensive, short-lived, troublesome, easy to cut through, and prone to shifting away from the plants it's meant to water; and doesn't work in sandy soil because the water won't spread horizontally; but is potentially good for permanent plantings like raspberries. For other prime gardening advice --- like why you should never water seedlings --- go read the book! Want to know how we make a living on the land? Read our microbusiness ebook. After almost 3 weeks of waiting, the new Briggs and Stratton flywheel puller arrived in the mail and today was the day to put it into action. I was planning on having pictures of the operation and maybe a short video, but all that went out the window when I realized my mistake in ordering the wrong flywheel puller. At least I know which one we don't need. Hopefully with a bit more homework I can determine exactly which flywheel puller is needed for this particular Craftsman. Mom picked up another half dozen bags of yard waste along her city curb and brought it out to me last weekend. "It smells foul," she warned me. "I think there might be dog poop in it, or something awful." She was right that the grass clippings and autumn leaves stunk to high heaven, but when I opened the bags and sent my gloved hands feeling around, all I came across were some sodden bits. My best guess is that a gardener bagged up his refuse last summer, then tossed the bags into the garage and forgot about them. The moisture in the leaves started some anaerobic decomposition and resulted in a stink, but no real harm was done. 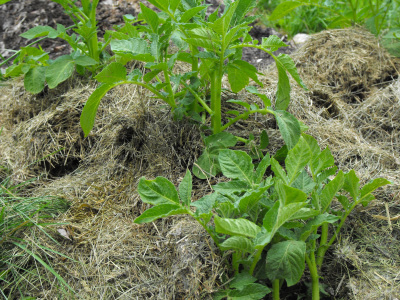 I'd been meaning to hill my potatoes --- you're supposed to hill them at four inches, and they somehow leapt from three inches to a foot this week --- but decided to use Ruth Stout's method instead and just put my spoiled grass clippings and leaves on top of the raised beds. Technically, I'm not really following her lead since I planted the potatoes in normal soil, but I've read that planting potatoes straight into spoiled hay really only works when you've built up wonderful garden soil, and I was planting in new beds. Take a look at the embedded video to see a 90 year old Ruth Stout in her garden, or skip ahead to 7 minutes into the video to see her planting potatoes. In other potato news, I should mention that the potato plants I covered with buckets during the last frost are three times bigger than the ones I let the frost nip. On the other hand, the beds that I let the chickens work on for five days instead of three days have potato plants twice as big as the other beds, even though the fomer were uncovered during the frost. I'm guessing the boost of nitrogen let them grow large enough not to mind the cold weather. Thanks, Mom, for the time-saving mulches! 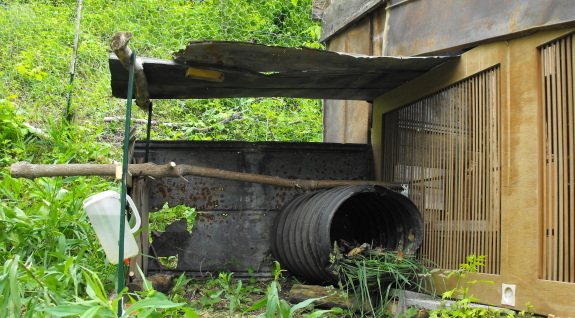 Check out our homemade chicken waterer, a time-saver in the coop. For those of you who don't like numbers --- thanks for slogging through this technical lunchtime series. I've saved the best for last! Nearly all seed companies catering to our demographic simply buy bulk seed, repackage it in pretty envelopes, and sell it for high prices. Only a few seed companies either grow their own seeds or perform large seed trials to ensure that the seeds they're selling are the proper variety, are vigorous, and have high germination rates. Without these tests, you could end up in the same boat I was in last year --- I bought some Goldbar Hybrid seeds from Jung last year, and ended up with a squash that looked nothing like the picture on the website. Steve Solomon contacted dozens of seed companies to inquire about their growing methods, and came up with these few recommended suppliers for the United States. He notes that you'll get the best results by buying from a company in your climate zone. I've always wondered which seed companies were good and which ones were not, so I'm glad to finally read an in depth analysis without lots of guesswork! Quit your job and start to live! Microbusiness Independence shows how. I just noticed this back door to the chicken pasture Lucy installed recently and growled at her while I stitched it back together. 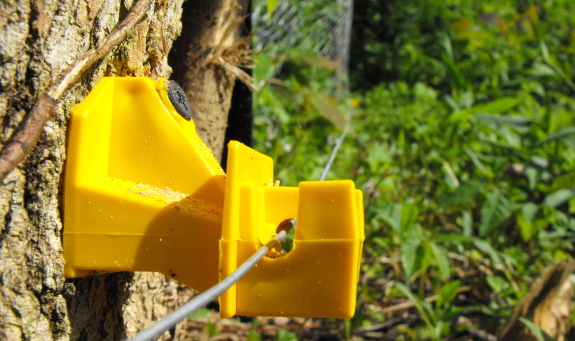 We could double down on securing the bottom edge with some additional fastening, or hook up the electric fence charger and run a strand at nose height all along the perimeter. Another option would be to stop giving the pastured chickens any scraps and divert that nutrition to the chicken tractors or worm bin. None of these choices work for me because they avoid the root problem of Lucy's failure to recognize that all food scraps belong to us and she needs special permission to access even a banana peel. It may seem like a tall order to train a dog to fight the urge to eat something yummy, but I've seen it happen before and feel that Lucy is serious about doing her part in being a team player. We just need to discover where the communication is breaking down and put some extra effort in explaining this critical lesson. 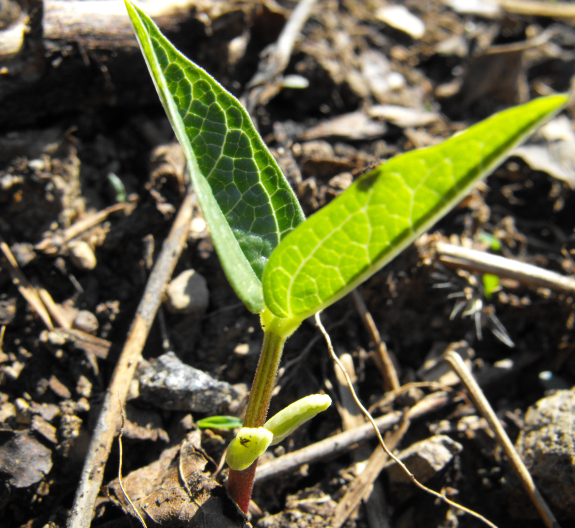 Torrential rains last weekend hastened germination of the previous week's planting. First came the corn, then the green beans. 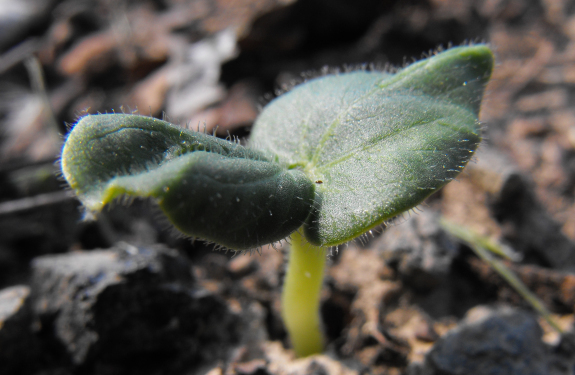 A day or two later, I noticed a strange little seedling that looked like a weed but was growing in straight rows. 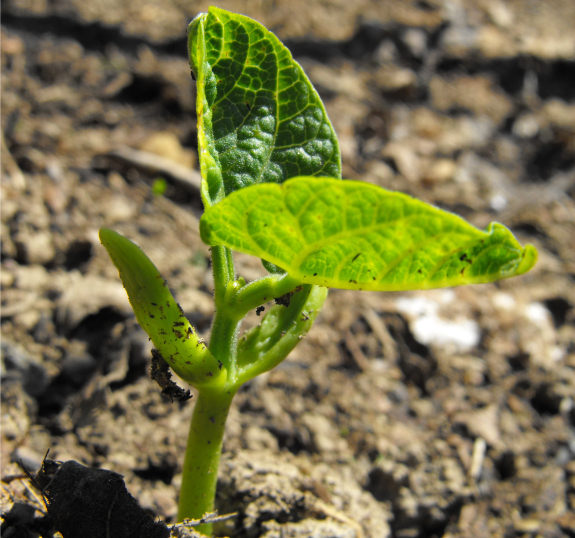 I checked my garden map and discovered that the seedlings were one of this year's experiments --- urd beans for sprouting. 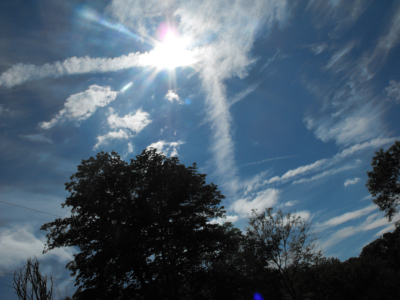 Scorching temperatures (highs near 90) tempted even the extreme heat-lovers out of the ground. By Friday, a few of the okra, melons, and cucumbers were up. But these plants are all gambles, put in the ground two weeks before the frost-free date, and I suspect this will be a year for replanting. There's a good chance of frost both tonight and tomorrow night, and I probably don't have enough row covers to protect everyone. What were the odds we'd get a redbud winter, dogwood winter, and blackberry winter all in one year? Probably pretty good considering that our frost free date is still a week away. Don't lose a single chicken to the heat. Protect your flock from spills and heat stroke with an automatic chicken waterer. Despite relying on complete organic fertilizer as his primary source of soil nutrients, Steve Solomon is clearly an expert compost-maker. For those of us who use a slapdash approach to composting, Solomon's composting description in Gardening When It Counts is a must-read. He explains that a good compost has more than 1.5% nitrogen, a C:N ratio no higher than 15:1, and lots of micronutrients. The carbon to nitrogen ratio, often shortened to "C:N" or "C/N" is at the heart of building a perfect compost heap. The availability of nitrogen in the compost is largely determined by this ratio, which can be thought of as a bit like the pH scale. A C:N ratio of 12:1 (twelve parts carbon to one part nitrogen) is "neutral" --- this is the C:N ratio of soil humus and is relatively stable. Most plant matter has a C:N ratio higher than 12:1, which means that decomposing microorganisms require a net input of nitrogen while they're breaking down the first of the carbon --- this is why putting fresh wood chips on your garden does more harm than good, locking up the soil nitrogen for the first few years before the chips break down (and their C:N ratio drops low enough) so that they begin releasing nitrogen. On the other end of the spectrum, chicken manure has a C:N ratio of about 6:1, which means that the manure provides nitrogen to the soil, and actually breaks down soil humus in the process. The table below lists the C:N ratios of various compostables. For immediate use on your garden, you can mix and match until the C:N ratio of your pile is around 15:1. Luckily for those of us with large masses of high C:N waste, a compost pile's C:N ratio will slowly drop over time as microorganisms break down the carbon-based compounds and make nitrogen more available. If you mix an incipient compost with a C:N ratio of 30:1 into warm soil, for example, it will break down in about six weeks. Compost grinders and tumblers will expedite the process, but your compost will overheat in the process and you will lose a lot of your nutrients as gases like methane, ammonia, and carbon dioxide. Steve Solomon instead recommends composting slowly, starting a pile in the fall, turning it when the apples bloom, and then turning it again a month later if it's not done. 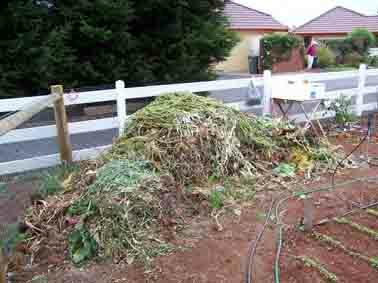 Spread garden and kitchen waste in a pile 5 to 7 feet across, five feet long, and eight inches thick. 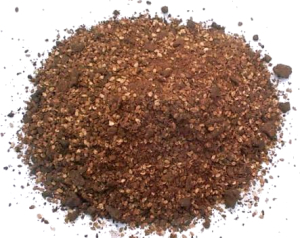 Add a low C:N component --- 5 to 10% of the mass of layer 1 if you're using poultry manure or cow or horse manure with no bedding, or 2 to 5% if you're using seed meal. Repeat steps 1 through 4 until the pile is 4 to 6 feet tall. 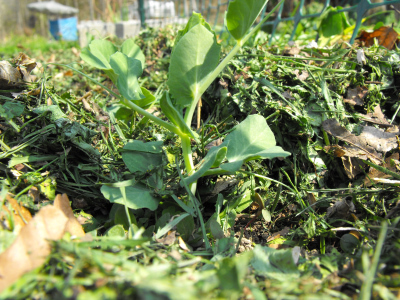 Cover the pile with a thin layer of soil. 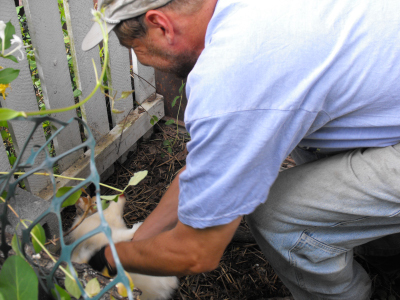 Steve Solomon notes that his garden and kitchen waste only produces enough compost to cover a third of his beds to one quarter inch deep, so he has to compost a neighbor's cow manure too. We're currently on a compost quest, so his suggestions of adding in lawn clippings, autumn leaves, and comfrey leaves were much appreciated. Quit your job and be free! Microbusiness Independence shows how. I figure if the ramshackled wheel barrow makes it through its first week back on the job then its got a bright future here on the farm. No complaints from its main operator after several heavy trips. I predict this fix to last around 2 years. While we were gone on our honeymoon last fall, our deterrents got stuck and the deer ate the recently transplanted strawberries down to the ground. This spring, the plants grew so slowly, I lost faith. After seeing the size of my father's plants a zone or two south in April, I figured our measly plants wouldn't give much of any strawberry harvest this year. Then came warm weather, and our strawberry plants grew like crazy. 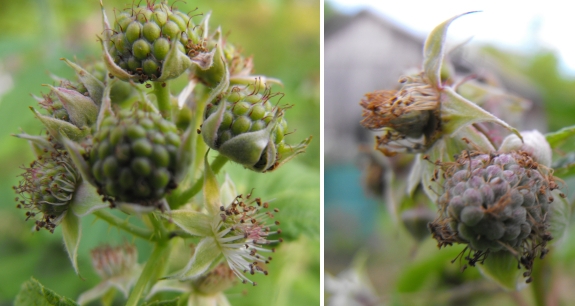 Before I knew it, they were big and blooming, then the little fruits started to swell. And now the first strawberry is blushing pink! Maybe we'll be eating luscious strawberries by the end of the week. 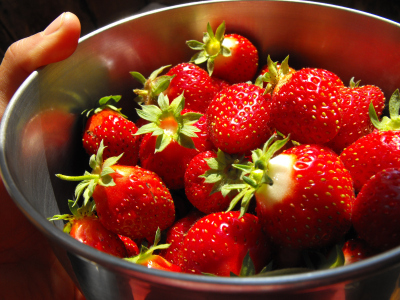 Homegrown strawberries are a lot like homegrown tomatoes --- once you eat one, you'll never touch storebought again. No, I won't share. Plant your own! Our homemade chicken waterers stood the test of the honeymoon much better --- we came home to hydrated chickens who hadn't missed us at all. 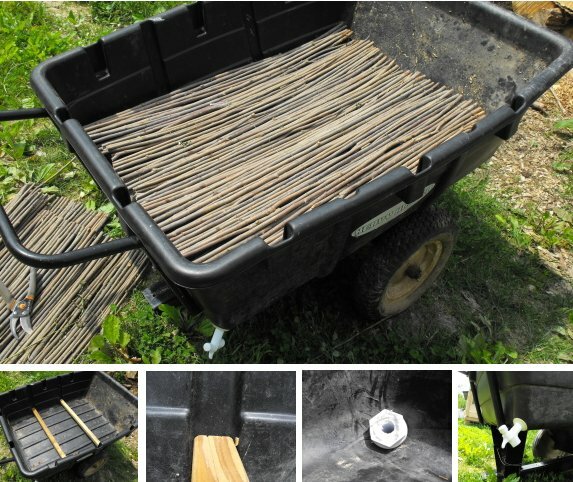 I thought I would end my wheelbarrow thread with an extreme version that cost a bit over a hundred dollars. What I like most about this flavor is the ability to lay it flat on the ground to ease loading. 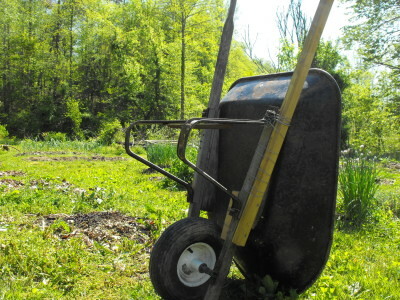 It's way more wheelbarrow than we need around here, but I can't help but to admire the design. I run across these interesting pupa now and then when I dig around in my garden in the spring. They're hard and shiny, seemingly sound asleep, but then the tail end begins to rotate slowly when you pick the pupa up. Disturbing. I usually don't go in for wholesale destruction of insects, but for some reason I got it into my head that these pupa were the overwintering stage of the squash vine borer. So I fed every one I found to my chickens (who were very appreciative.) 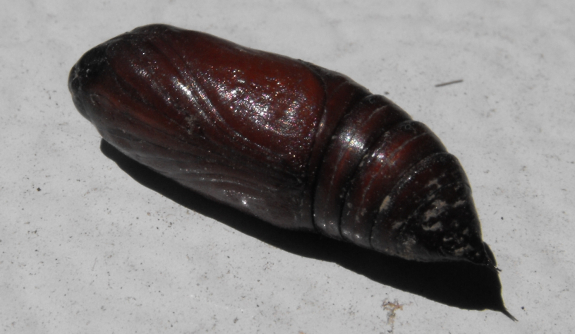 A bit of research doesn't turn up any images of squash vine borer pupa, but does show several hawk and sphinx moth pupa that look a lot like this. If I remember, I'll stick the next one I find into a jar and see what hatches out. Any better ideas? Check out our homemade chicken waterer, great in tractors and coops. When I was a youngster, our nearest neighbor's front yard was decked out with a huge tire, painted white and filled with flowers. A metal glider and chairs, also painted white, stood nearby under the shade of a large catalpa, just waiting for a visitor to come by and sit for a spell. There were flowers --- nearly all annuals that were easy to grow from seed, like marigolds and cockscomb --- and a blooming bush. Across the yard was a pen of chickens, then the barn, and in the other direction was the vegetable garden, laid out in straight rows. The couple clearly spent considerable time, though little money, keeping their yard in impeccable shape. 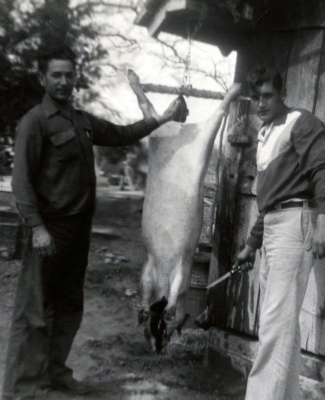 Although my neighbors were white, their space could have graced the pages of Richard Westmacott's African-American Gardens and Yards in the Rural South, with the notable lack of a hog butchering station and a swept dirt floor. 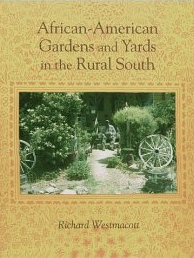 Westmacott analyzed the yards of 47 rural families spread across Alabama, Georgia, and South Carolina, focusing on folks who had reached or passed middle age. If there was such a thing as a traditional Southern, African-American garden, he wanted to find it. And he did see similarities, many noted in my opening paragraph. Rather than being showcased landscapes, the yards were subsistence gardens where work and leisure intermingled. In most cases, the yard had become an extension of the house, the spot for a family barbecue or hog butchering session. But where did the similarities come from? Could they be traced back to the families' heritage in western Africa, to their slave background, or were the similarities simply the common byproduct of being poor in the South? While you're waiting for the next installment of this lunchtime series, check out a unique deer deterrent method I found in the book. 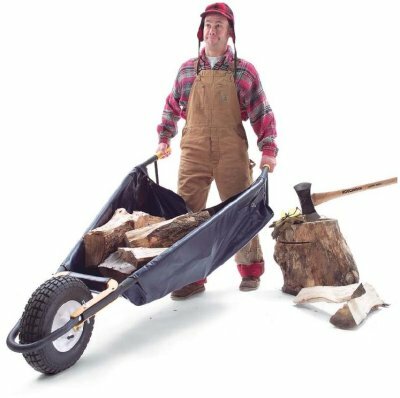 How dare you talk about extreme wheelbarrows without mentioning the Honda HP450 power carrier! Norman is right, this Honda HP450 is one tough cookie. I wonder if you could modify it to accept some sort of seat where you could sit and steer the thing to your jobsite, get out and put the seat aside till the work gets done, and then drive it back to the truck? 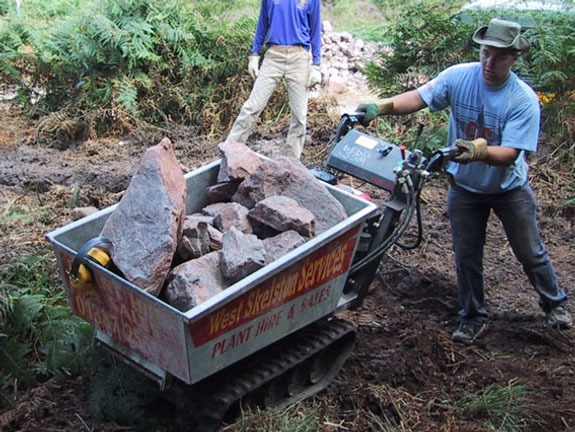 Photo credit goes to the good folks at IMBA for this great shot of the HP450 in action during a trail building day. Everything I do in the garden at this time of year is a gamble. Will a late frost negate my efforts? Or will I get away with pretending summer weather is here to stay and reap an early harvest? 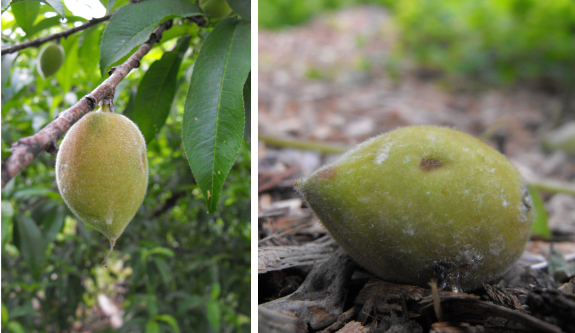 I've been eying our peach tree for weeks as the ovaries began to swell and resemble miniature fruits. If nothing goes wrong, this year will be our first harvest and I've resolved to thin the fruits even though thinning is really optional. On the negative side, thinning takes time, and if you thin and then get a heavy, late frost, you will lose a lot of your crop. 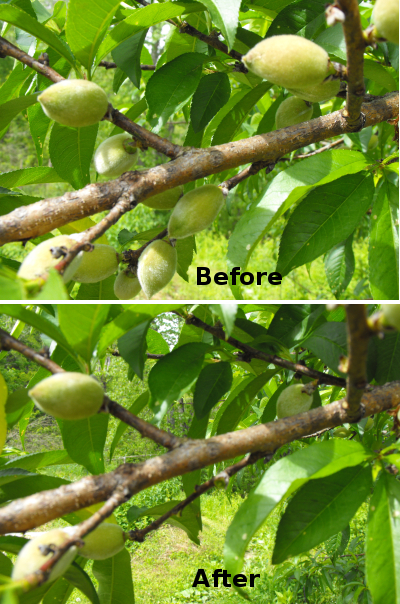 On the other hand, timely thinning is supposed to result in fruits that are bigger and sweeter, and will reduce the chance of limbs breaking under the fruits' weight. I've read that you get about the same weight of fruit whether you thin or not; it's your choice whether you want a lot of small fruits that are mostly pit or fewer big fruits. As long as you don't think you'll have any more below freezing weather, the earlier you thin the better since the tree will now be pumping all of its energy into the chosen fruits. Extension service websites tell you to thin peaches to six to eight inches apart, but I couldn't quite bear to take off so many fruits and instead settled on about four to five inches between peaches. I still pulled a full quart of immature fruits off our oldest peach, and a smattering from our younger peach and nectarine. I'm trying very, very hard not to count my peaches before they hatch...um, ripen. Check out our homemade chicken waterer, perfect for spill-proof watering in tractors. Westmacott perused accounts and photos of western Africa from the eighteenth and nineteenth centuries, searching for similarities between historical African gardens and current African-American gardens in the rural South. Western Africa is a diverse area, ranging from rainforest to subtropical desert, and the agricultural heritage of west Africans is similarly diverse. 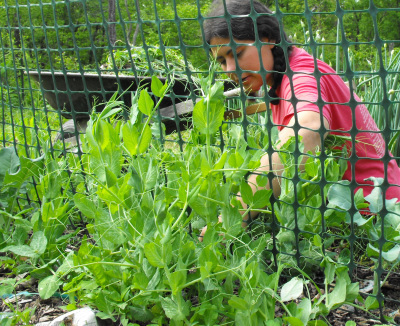 Some people were nomadic herders, others had grain-based diets much like our own, while still others practiced what Westmacott called "vegeculture" but which I would call forest gardening --- edible trees, roots, vines, and grains all mashed together into one space. 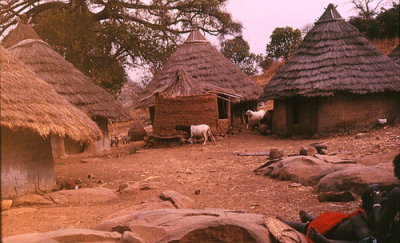 West Africans who grew what we now consider traditional gardens typically clustered their houses into fenced compounds. They grazed any livestock they might happen to have outside during the day, but took the animals in at night. Crops were grown outside the village compound in intensively tilled and manured land, while trees with edible fruits (like bananas, coconuts, and mangos) were planted within the village for shade. As you can probably guess from my previous lunchtime series on Chinese and Central American traditional gardening practices, I was intrigued by this look into traditional African agriculture. But very few of the African practices seemed to carry over to the United States. 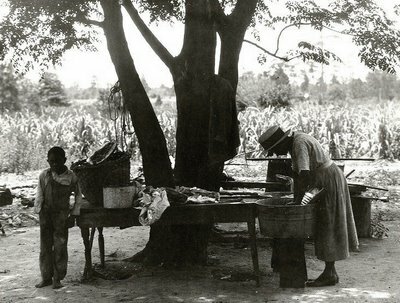 Shade trees are ubiquitous in African-American yards in the South, but the trees are not edibles, and there is no sign of forest gardening. The one aspect of the southern gardens that Westmacott felt confident tracing back to Africa was the swept yard. 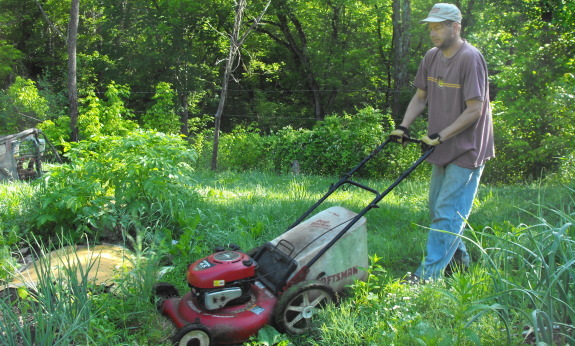 Although inexpensive motorized lawnmowers are now pushing swept yards into history, many of the old timey African-American families in Westmacott's study stuck to the traditional bare earth yard. The families spent time every day hoeing weeds out of the yard, then sweeping every bit of trash and debris out of the living space. The result was an area where children could play and adults could easily sit and talk, without danger of snakes or ticks. The practice can be clearly traced back to Africa, not only because Africans still keep up swept yards, but also because bare earth yards just don't work in more temperate climates. In areas without long dry seasons a swept yard will turn to mud and become impassable for a large portion of the year. I guess we won't be making a swept earth yard here! 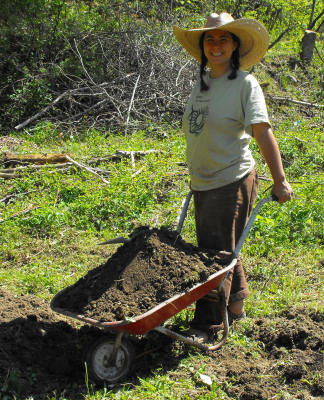 Check out our ebook about quitting your job and making a living on the land. This is the 4th breach of security for the chicken pasture perimeter thanks to Lucy and her naughty behavior. Since the spring mowing and future fence building is starting to crunch our time I think I'm leaning more towards that nose high stretch of electric fence wire as a new method of keeping her out. With any luck Lucy will get the message right away and reclaim her title as best dog in the galaxy. Me: "The weeds are growing faster than I can pull them! The grass is growing faster than we can cut it! And we still need to plant the rest of the summer garden, build the next chicken pasture, and do ten thousand other things! The world is coming to an end! Ack! Ack!" Mark: "You know, we're better off than we were at this time last year. Cheer up --- you said you wanted things to grow, and they're growing." For those of you who are in the midst of gardening frenzy, I hope you can take Mark's advice (along with a deep breath) and enjoy the beauty of spring. Remember, there's always winter to catch up on all of those important, long term projects, and it does seem to help to let the weeds grow up and hide problem spots you aren't going to have time to deal with this year. Right now, I figure we're doing well if we manage to tread water and not sink much further behind than we already are. Save yourself some time and install a homemade chicken waterer. Less time fussing over filthy waterers means more time sitting on the porch watching the flowers grow. Westmacott explained that gardening practices of slaves in the American South were almost as diverse as those in Africa. Slaves unlucky enough to live in upland regions tended to be worked from sunup to sundown under the heavy thumb of an overseer --- they usually had no time to tend their own garden, and were seldom allowed to keep livestock for their own consumption. 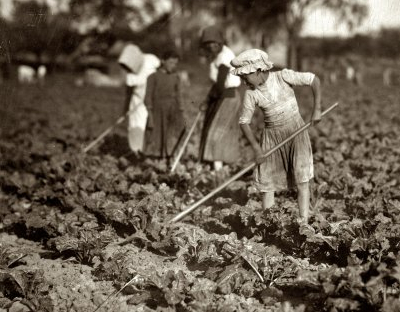 The "luckier" slaves on large plantations along the coast were often given a daily quota of chores to pursue at their own speed, and if they were fast and hard-working, they could make time to grow their own vegetables and keep a hog and chickens. The families craved this bit of self-sufficiency, which could mean the difference between malnutrition and relative health. A focus on pigs and chickens as a path to meat self-sufficiency carries through to the modern day in the African-American families Westmacott interviewed. Many of the families had either hogs, chickens, or both, and hog butchering stations in nearly all of the yards showed that the families not currently keeping pigs used to. Despite the daunting size of a full-grown pig, about half of the families still slaughtered their own hogs, explaining that butchers won't return ears and chitterlings, which the families like to cook with. Pigs and chickens (and mules, nearly all of which have been replaced by tractors and rototillers) made the traditional Southern, African-American family very self-sufficient. Families used to feed their food scraps and excess produce to the animals and get meat and manure in return. This homesteading feature is quickly disappearing, with purchased fertilizers and grocery store meat now cheap enough that families see little need to keep their own livestock. Looking for independence in your own life? Our ebook walks you through starting a small business that will pay all of your bills in just a few hours a week. This nose high strand of electric fence wire will help to keep Lucy out and any other stray critters that might be a potential threat when she takes her random naps. Despite being a vegeholic, I have to admit that the prettiest part of the garden right now is the flowers. 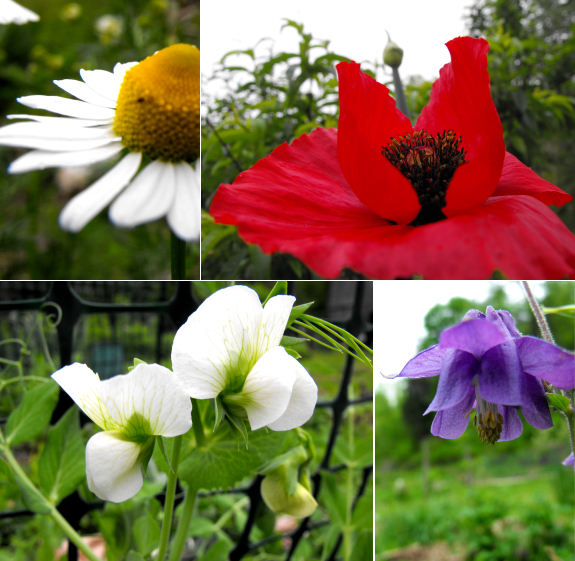 Our chamomile and columbine are in full bloom, and the first brilliant red poppy unfurled its petals Wednesday morning. It's hard to walk through the yard without having my eyes drawn to that splash of red. But the most exciting flower is white and relatively small, sitting atop a pea vine. Juicy pods are now only days away, and they promise to spice up our current garden diet of lettuce, greens, pea tendrils, kale flowers, mushrooms, Egyptian onions, parsley, fresh eggs, and slightly woody overwintered carrots and parsnips. The best thing about eating in season is that when you're starting to get sick of collards every day, something new pops up to tempt your palate. 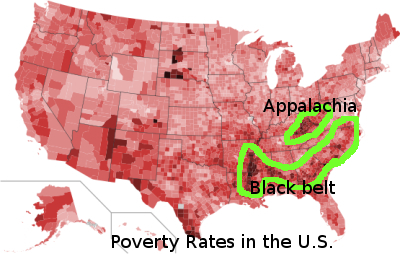 Perhaps the most important factor influencing African-American gardens in the rural South --- and the hardest to disentangle from other potential factors --- is poverty. If you were born black in America, you are nearly three times as likely to live in poverty as if you were born white. Many of the "unique" aspects of African-American gardens are ones I grew up with in my own area, since Appalachia is nearly as poor as the so-called "Black Belt" further south. Poor people tend to have smaller houses, so it's no surprise that their yards act as an extension of their living space. Even though most of the families in Westacott's study now have electricity and running water, many continued to use the back porch and/or the area around their well as a center of cooking and washing. Anyone who has cooked in the South in the summer without air-conditioning can understand why you might want to can, make soap, or even fry up your dinner outside over a fire rather than heating up the whole house. And if you've been crammed into five hundred square feet with five other human beings, you might choose to shell the peas outside under a shade tree too. Westacott noted that "piles of temporarily discarded or recently-acquired-for-some-unspecified-use-in-the-future materials are commonplace on most small farms and rural properties." See, that trash heap by our barn is just a sign of frugal ingenuity! 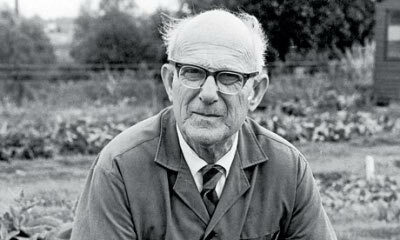 The author explained that similar piles grace most of the properties he visited, for use in building animal pens and fixing other objects around the farm. The families he visited even used found art to brighten up their front yards, lining their paths with colored bottles and tacking hubcaps to the fence. Stuck in a cubicle? Our ebook shows you the path to Microbusiness Independence. 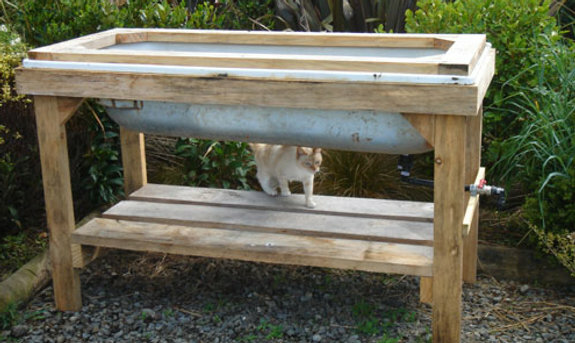 In looking for ideas to expand our outdoor worm farming I found this clever use of a discarded bathtub as a medium sized worm bin at the pleasant lifeboat.co.nz. We've decided to give this approach a try along with a few others so we can determine which one is most trouble free. If you've got a good source of horse manure then you really need to put a small army of worms to work on that manure to speed up the composting action and take advantage of that wonderful worm tea. It's one of those things we neglected to set aside time to build back in the beginning, but sometimes it takes a while to wake up to the wonders of worm assisted home grown compost. 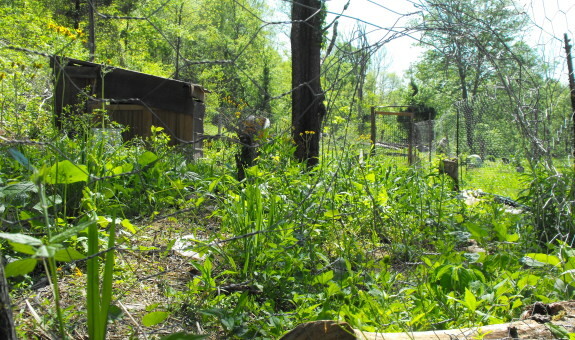 I'm afraid our chicken pasture contest is a bit of a wash. As the weeds grow taller and taller and our pudgy chickens become slower and slower, it's becoming clear that there will be no scratching the earth bare at this rate. 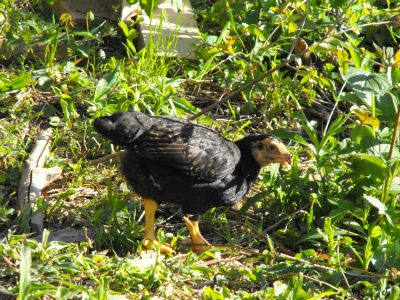 Our Dark Cornish chickens don't seem to be as avid foragers as I'd hoped they'd be, although they do like picking through the huge mound of weeds I keep wheelbarrowing into their pasture. What you all probably care about the most is --- who wins?! I've decided to name Bethany our grand prize winner since she picked the furthest away date which is closest to infinity. Bethany, drop me an email with your address and your onions and flowers will be in the mail next week. The more scientific among you may be asking --- what now? I still want to have the chickens scratch up some of the earth to expedite grain planting, so we're going to subdivide their current pasture in hopes that a smaller enclosure will actually get scratched bare. Given the proximity of butchering day, we may wait to build more pastures until next year, and will be rethinking our broiler experiment --- maybe we'd be better off having the slow, fat broilers in tractors and our perky layers achieving self sufficiency on pasture? Stay tuned for future experimentation! Our chicks drink copious, clean water from their homemade chicken waterer. 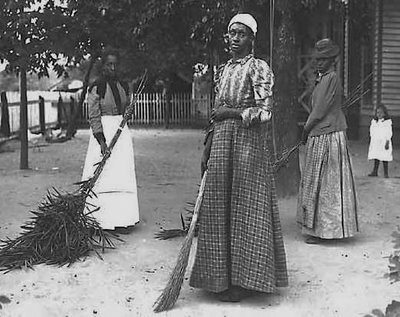 Other common features in African-American gardens in the rural South were probably also linked to poverty. Although potted plants were common --- presumably a remnant of a transient past --- nearly all gardening was extensive instead of intensive. 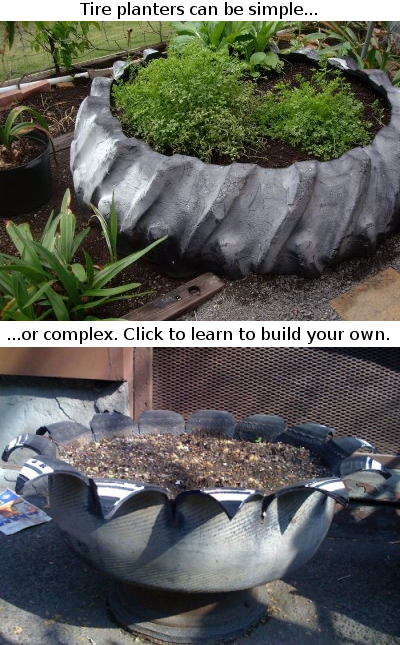 Only one gardener of the 47 families studied used raised beds, and hers were really vegetables grow in tire planters. In most of the gardens Westmacott studied, plants were spaced far apart in rows and were seldom watered except during transplanting. Although records from earlier African-American gardens showed the ubiquity of rain barrels, current gardeners tended to rely solely on rain and to believe that drought was God's will. In the end, I'm disappointed that I can't extract any permaculture techniques from the African-American gardens, but they do seem to prove Solomon's point. People who value yield over beauty, who garden on a shoestring budget to feed their families, do seem to practice extensive gardening. Learn to market your invention, quit your job, and start to live! Since the do it yourself golf cart dump box is working out so well we've decided the Heavy Hauler garden cart can start its new carreer as a large outdoor worm bin. It took less than an hour to scrounge around for the parts and put it all together. I used a couple of 2x2's cut to 30.5 inches for the bottom support and modified a portion of the willow wall to function as the floor. A small gap at the bottom helps to prevent the spigot from clogging and worms from drowning in their own tea. When I checked the bees at the beginning of May, I was a bit concerned about one colony. The hive was chock full of brood, but had only one shallow frame of honey, a vast reduction in stores since the last time I checked. Would the bees keep consuming honey and starve despite the nectar flow? A few days later, I noticed a lot of aimless activity in front of that hive. Usually, a busy hive is like an airport with lots of takeoffs and landings, but this hive had a bunch of circling workers just wandering around in the air. I'm pretty sure I caught the orientation flight of new foraging workers getting their bearings so that they'd know which hive was their home. 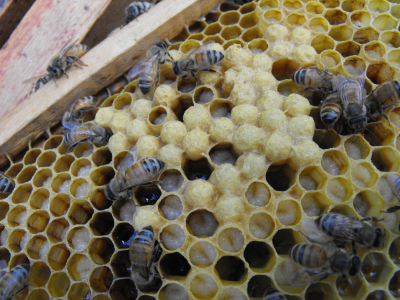 Sure enough, a hive check on May 13 showed that my hungry hive was honeyless no longer. The bees were drawing out comb and filling it with nectar just as fast as their sister hives, making me think that we may need to make plans for our first honey harvest soon. Our homemade chicken waterer is always POOP-free. Sometimes an old stump will surrender with a bit of spud bar leverage. In the last couple of weeks, "bad bugs" have started to show up in the garden. 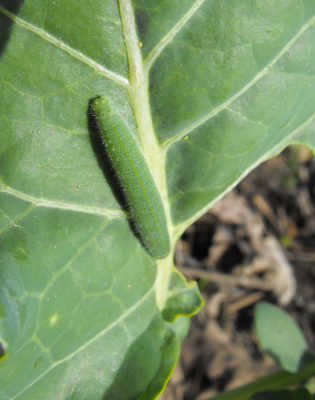 This guy is a "cabbage worm" (aka Cabbage White caterpillar) and it enjoys gobbling big bites out of our broccoli and cabbage plants. 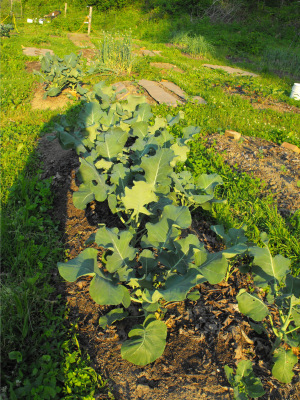 My approach to cabbage worm control is pretty lackluster, but it seems to work --- I handpick the caterpillars whenever I happen to notice them, then feed them to the chickens. If you're going to head out to check your plants, look for the dark pellets of frass (poop) on leaves, then lean in closer and hunt down the caterpillar who left the traces behind. Cabbage worms like to orient their bodies parallel to veins, making them difficult to find without the tell-tale frass. I spend even less time worrying about flea beetles. Tiny black specks hopping around on the potatoes alerted me to their presence last week and a close look showed that the potato leaves are now perforated with hundreds of tiny holes. But the plants don't seem to mind, so I'm ignoring the flea beetles. I don't mean to suggest that all "bad bugs" are harmless or easy to deal with. I'm still picking asparagus beetles every week, hoping to put a dent in their population and save our fronds, and I know that we'll be battling squash vine borers all summer. But I hope that you'll consider a more laissez-faire approach to bad bugs, at least until they prove themselves a major hindrance to your garden. Our youngest addition to the Wetknee flock showed up for its first day of work. We've had issues with using a broody hen to hatch eggs in the past, and our current experiment (which I'll outline in detail at lunch) was only minimally successful. But the idea has so much merit from a homesteading perspective that we'll keep plugging away until we make it work. 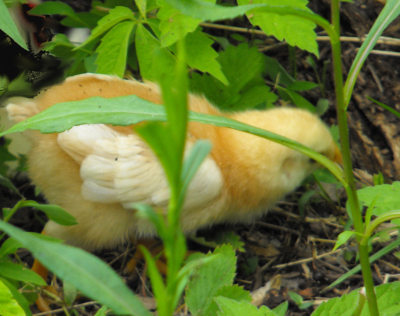 For example, look at this --- a mother hen teaching her chick to forage on day two! They spent the first day hunkered down in the nest, but by midafternoon Sunday, the Cochin had led the way to the ground and was scratching up worms. She picked up each wriggler, clucked over it enthusiastically, then dropped it at the chick's feet. Granted, the chick was less than sure what to do with this largesse, but I still think such early exposure will turn it into an awesome forager. If that's not enough to convince you of the utility of the natural approach to chick-rearing, consider how much electricity we'll be saving by not having to run an incubator for three weeks and then a heat lamp for another month. 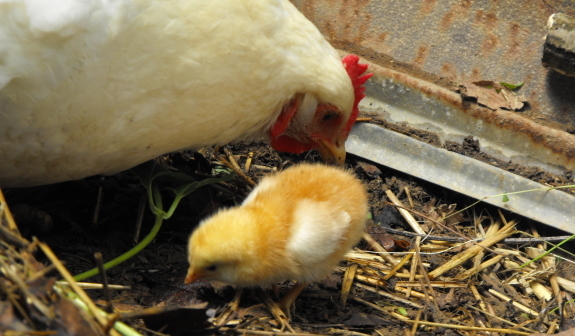 After following its mother around the brood coop for ten minutes, the chick decided it was chilly, so it poked at its mother's feathers, then tunneled underneath the hen and disappeared. Best yet, I've discovered that I can delegate most of the worrying to the mother hen. Yes, we will definitely be trying the broody hen approach again, and I have high hopes the third time will be the charm. Check out our microbusiness ebook and give yourself the leisure to do what you love. When we were in South Carolina last month, Daddy gave me eleven fertilized Rhode Island Red eggs to try to hatch out. I brought them home and started preheating the incubator, only to discover that the cheap brand we'd gotten at the feed store only works if you keep your room temperature very constant. So I made a spur of the moment decision and popped the eggs in the brood coop with our White Cochin instead. Regular readers may remember that we tried a similar experiment last fall, with the result that our hen killed the only chick that hatched. But I wanted to give our hen another chance before putting her on the dinner table, figuring she may have killed her first batch of chicks because their color made it obvious that they weren't her own. 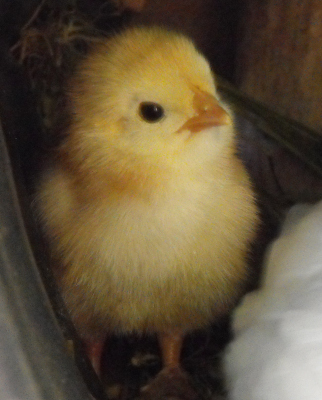 Rhode Island Red chicks are pale, so color wouldn't be an issue this time around. I added a lip to her culvert nest so that none of the eggs would roll out, then I threw the hen in the coop. I'd heard her make a broody moan the week before, but she wasn't really broody yet and it took her most of the week to decide the eggs were worth sitting on. By then, I figured our chances of getting a hatch were close to nill, so I didn't even post about it, but I left the hen to sit on the nest since I figured I might as well get the broodiness out of her system. Saturday morning, I dropped by to toss in a bit of feed...and saw a fluffy chick running in and out of the Cochin's feathers! 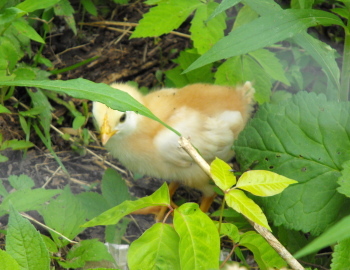 I moved the automatic chicken waterer into the culvert nest at chick eye level and tossed in some chick feed, and the peep immediately followed the mother's lead, eating and drinking. It seems quite healthy, and the Cochin has clearly accepted it, so the only question now is...will it be a new layer or a broiler? And have I finally learned enough that next time we'll get a good hatch rate? I'll be posting a review of the incubator over on our chicken blog once I get a chance to write it up, so stay tuned! 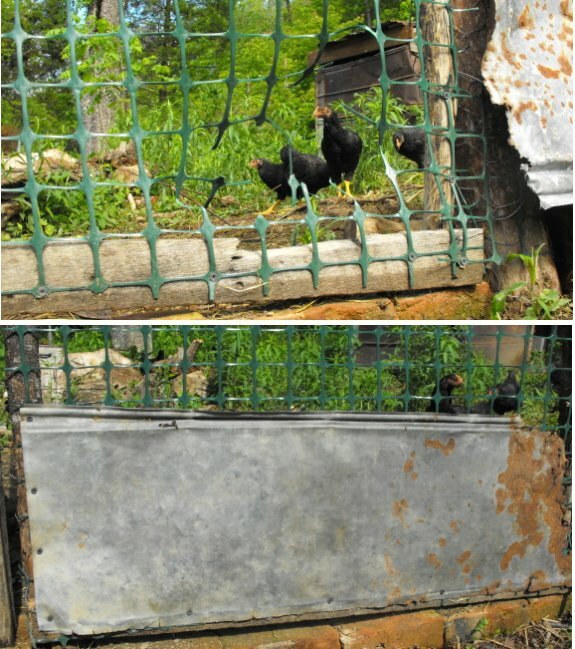 I decided to use an old piece of tin to shore up the chicken pasture gate. 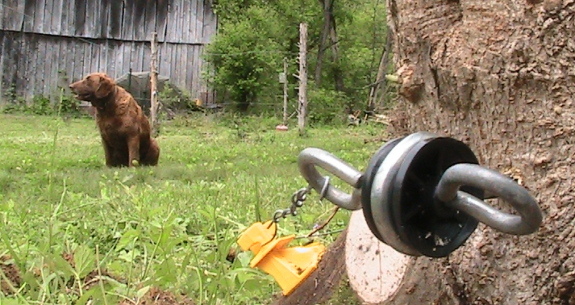 Putting a strand of electric wire across the gate bottom would make getting in and out of the pasture a small hassle. After several days of basking in the sun the solar fence box seems to have a weak battery, which means our next step will be to spring for the 40 dollar electric fence charger. We have a horrible time with most of our cucurbits. 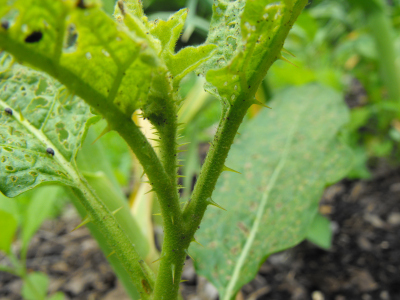 Even before the squashes fall prey to the vine borer, the cucumbers and canteloupes come down with powdery mildew. Or maybe it's cucumber mosaic or bacterial wilt. All I know is that the plants start to bloom, then they keel over. I've never seen data to back this up, but many organic gardeners believe that pest and disease infestations originally stem from ill health on the part of your crop. The idea makes sense --- if we don't eat a well-rounded diet, we're more likely to catch a cold, so why wouldn't the same be true of our cucurbits? Following this reasoning, I top-dressed all of our baby cucurbits with a hearty scoop of compost, hoping to perk them up so they'll outgrow their diseases (and the weeds.) 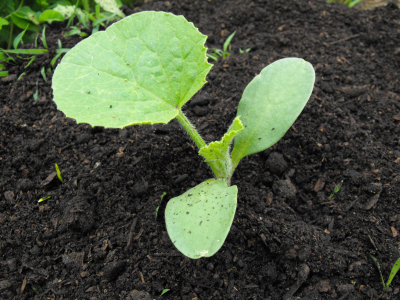 Native Americans used a similar idea when they planted squash on hills of dirt over fresh fish. Maybe I'll get lucky this year and taste our first home-grown canteloupe? Our homemade chicken waterer keeps water clean and poop-free. The tomato blight of 2009 left me close to tears last summer, and with a serious craving for red sauce this spring. This year is also a tomato seed turning point. I last saved seeds in 2007, assuming that I could collect more in 2009, but I didn't manage to harvest any tomato seeds before the blight hit. This spring, my three year old seeds had low germination percentages, so I absolutely must have ripe tomatoes to save seeds from this year or I'll have to rebuild my collection of the tastiest and most utilitarian tomato varieties from scratch. So I'm experimenting with spacing, location, and timing in search of a blight-free tomato harvest. The goal of the first two experiments is to allow lots of sunlight and air movement around the plants so that they'll dry off quickly after rains. To that end, I've planted all of our tomatoes in the sunniest part of the garden, and am doubling the spacing between plants to three feet. In addition, we'll be individually staking the plants and pruning off the suckers to promote even speedier drying. Meanwhile, I'm trying three different planting times/ages. I've discovered in the past that young seedlings started in a cold frame then transplanted to the garden do better than leggy tomato plants that have been struggling on a windowsill for months. So the majority of my plants have just been transplanted out at the two sets of true leaves stage. On the other hand, my neighbors believe in buying big transplants and putting them out earlier, covering the plants with bottomless milk jugs during cold spells and hoping that they will bear at least some harvest before blight sets in. A volunteer tomato came up in our lemon pot in the sunroom this spring, and I decided to transplant it out into the garden on April 21 to see how its growth compares to that of my younger transplants --- it's currently big and hefty, with about six pairs of true leaves. Finally, my father likes to tell me that he once direct-seeded tomatoes into the garden after all danger of frost was past and still got harvests nearly as quickly as from transplants. So I filled the last tomato spot with ten seeds and will weed the seedlings down to the strongest one once its up. Will it catch up with its transplanted siblings? Only time will tell. If all else fails, I have one last trick up my sleeve. One volunteer tomato plant survived the blight of 2009, and I carefully saved its seeds to add to my collection. I have high hopes that at least this one variety will be resistant enough to give me a crop. Here's hoping something works! Looking for a change in your own life? Microbusiness Independence will walk you through building a small business that allows you to quit your job. It only took about 2 minutes to install an eye hook on the port and starboard side of the do it yourself golf cart dump box. Now we have tie down points to attach a bungee cord to for easy snugging. 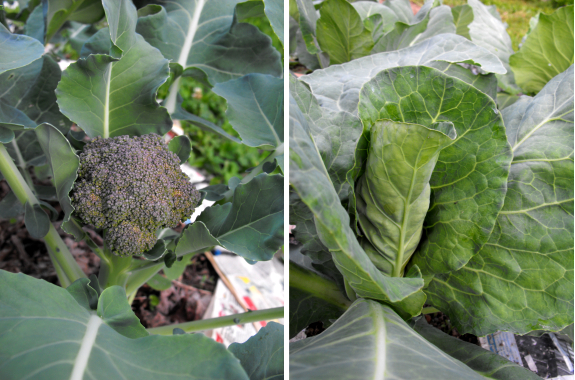 Once you've been gardening in an area for a while, you'll start seeing volunteer vegetables. Unless they're impinging on the space of a beloved crop, I often leave volunteers at least for a while, as a sort of insurance against catastrophe in other parts of the garden. But Mom reminded me that blight overwinters in left behind potatoes, and that my volunteers are vectors of infection. Oops! I ripped out those volunteers as fast as I could, hoping I hadn't let the blight loose on our farm again. 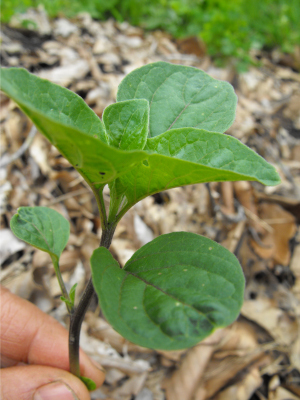 On the other hand, I've also read that the blight can overwinter in weedy nightshades, which we have several of around the farm. 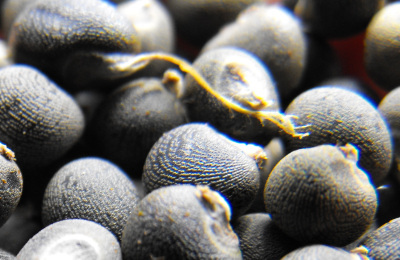 In the spring, the spores can travel several miles through the air, infecting all potatoes and tomatoes in their path. There's no way I can destroy all of the nightshades even on our farm, so I'm just hoping that the blight control measures I've put into place will be enough to protect my tomatoes. Too much water is bad in the spring, but is never a problem in the chicken coop. 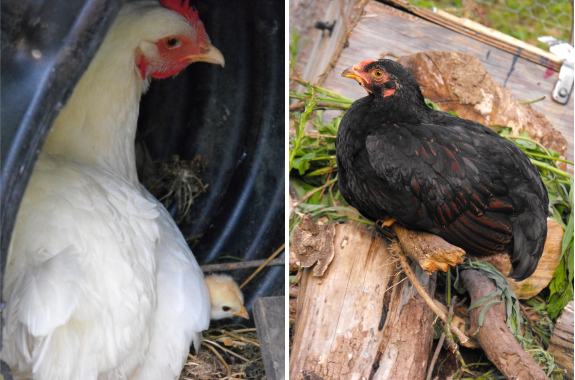 Keep your chickens well hydrated with a homemade chicken waterer. When we started our hives last year, we had to take a stand in the great excluder debate. 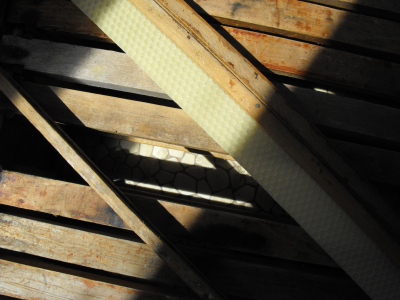 A queen excluder is basically a screen that you place between the brood box and the honey supers to ensure that the queen stays down where you want her and doesn't head up to lay eggs in the honey frames. Some folks swear by excluders, but other people point out that excluders make your hive more likely to swarm since your brood box can get congested in the spring. We opted to join the anti-excluder camp primarily because I knee-jerk in favor of anything that sounds more natural, and because I am too cheap to buy equipment we don't really need. Last year, our lack of an excluder caused absolutely no problems. Our bees were working hard to build up their hive, and the queen had no time or inclination to lay eggs in the honey supers. This year, though, I noticed that two of our hives have a bit of drone brood at the bottom of the lowest honey super. 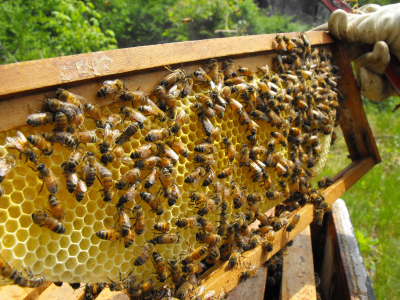 Which brings us to beekeeper debate number two: are drones a drain on the hive or an asset? I won't go into bee biology too far, but you need to understand that there are three kinds of bees in a honeybee hive. There's the queen --- one per hive, who lays all of the eggs and does nothing else. There are the workers --- many, many per hive, who do all of the work from foraging for pollen and nectar to cleaning the hive and raising the babies (brood.) Then there are the drones --- the only males in the hive, whose sole purpose is to head out every day in search of a mate. Since the queen only has to copulate once in her life, you can see that keeping a bunch of drones on tap is wasteful --- they eat like crazy and don't pull their weight. 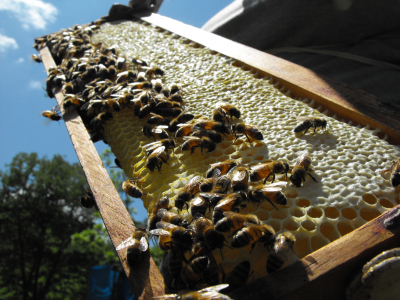 As a result, many beekeepers try to keep drone production to a minimum. Drone management comes down to managing the cell size in the brood box since the queen decides whether to lay eggs that will become workers or drones based on the size of the cell. Big cells are for drones; small cells are for workers. When drones reach their pupal stage, they're too big to fit into even their extra large cells, so workers build a little domed cap to seal the drone pupa in rather than the flat caps they build over worker brood. As a result, it's pretty easy for us to take a look at capped brood and know at a glance how much of it will turn into workers and how much into drones --- the photo here shows the domed caps of drone brood (along with some drone larvae too young to be capped.) Beekeepers who want to limit drone production will cut out drone-sized comb and replace it with worker-sized comb so that the queen will lay the latter rather than the former. Now we come back to the queen excluder. Without the excluder, when the brood box starts filling up but the queen still feels like laying eggs, she'll move up into the first honey super to lay. The problem is that honey cells are large, so the queen lays all drones up there --- a drain on the hive. On the other hand, a fascinating article by Walt Wright makes the point that natural hives keep 20% of their brood area in drones and that the hive will build all kinds of jurry-rigged drone cells if we prevent them from laying that 20%. He concludes that it's better to go ahead and let the hive produce drones rather than running the risk of lowering honey production with a queen excluder. I'm still in the learning stages of bee management, so I'm taking a bit of a wait and see approach. If there's a lot more drone brood at our next hive check, I'll probably put a super of foundationless frames beneath the brood box, letting the hive build more worker cells for the queen to lay in. That way, the queen will get to keep expanding the worker population, which will mean more nectar brought in from the field and more honey for the winter. On the other hand, if there's still just a bit of drone brood at the bottom of the first honey super, I'll figure the hive deserves their boy toys and leave it alone. Stuck in a cubicle? Find your path to Microbusiness Independence. The new flock steadily grew more interested in what I was doing to their pasture as the day went on. Now we have it split in two sections with a gate connecting each area. When I posted yesterday that weedy nightshades can carry the potato blight, both Mom and Zimmy asked me to clarify. Sorry to be confusing --- sometimes the botanist in me assumes things are obvious when they aren't. 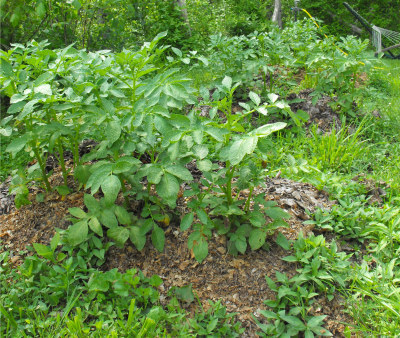 Since both Horse-Nettles and Black Nightshades share the same genus with tomatoes and potatoes, they also share susceptability to the blight and can help the disease overwinter. I call these plants "weedy nightshades" because all members of the family are sometimes referred to as "nightshades", and these two species are weeds in my garden. Last year, I thought I had sweet potato slip production figured out. 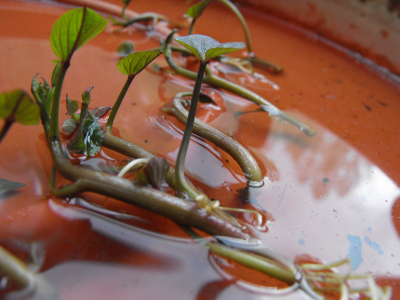 My method was quite simple --- submerge about a third of the potato in water, put the containers on a heat mat, break off sprouts once they form, then put the slips in water to grow roots. My only complaint was that starting the potatoes in early April meant I could only plant one bed at the frost free date and had to put out the rest of the sweet potatoes a bed or two at a time until early July. So this year I started my sweet potatoes near the end of March...and the tubers sat there doing nothing for a few weeks before over half of them rotted away. We're still on schedule to plant a bed of slips this week and will fill in all of the parts of the garden I'd allotted to sweet potatoes, but we didn't get the jump on the season I'd hoped for. Maybe March is just too early to start sweet potatoes? I also think I blew it by focusing on big tubers for sprouting, compared to the small tubers I used last year. Various extension service websites suggest that the optimal sweet potato for sprouting is only an inch and a half in diameter. Next year, I'll bypass those chunky monsters and use mini-tubers as seed stock. If I remember, I'd like to try another alternative technique next year as well. The pros start their sweet potatoes in hot beds of moist sand, and I think I can mimic that on a small scale by putting a seed starting tray full of sand on the heat pad instead of jars of water. I suspect the sand would prevent this year's molding problems by keeping the tubers moist but not wet. On the plus side, I discovered that chickens really enjoy half rotten sweet potatoes. Maybe once we work the kinks out of our propagation method, sweet potatoes will be a component of farm-grown chicken feed? Quit your job and start to live! 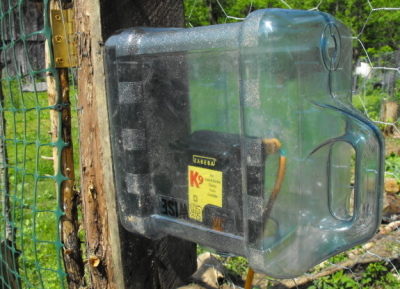 The drink dispenser I salvaged the spigot from for the garden cart worm bin is now doing duty as a waterproof enclosure for the new K9 electric fence charger. These units somehow get their grounding from the electric line, which is a change from other chargers. Of course, I haven't forgotten the peaches! How could I when our biggest tree is directly outside the kitchen window? Daddy was right that the tree would self-thin --- it wasn't quite happy with the job I did and dropped another couple dozen fruits the next week. But the remaining fruits are bigger every day and are still so numerous I can hardly wrap my mind around the bounty. Speaking of bigger every day, our growing flock is...growing. 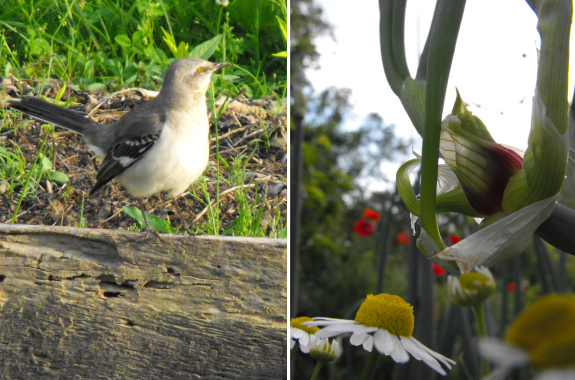 And our forest garden continues to attract wildlife and fill our lives with beauty. 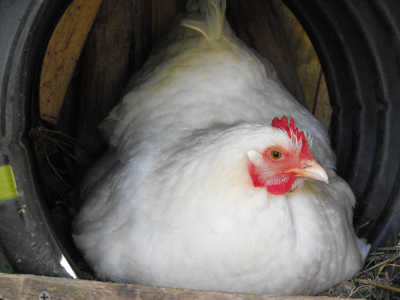 Treat your chickens to a POOP-free chicken waterer. We both feel a lot better now that the new chick and her mom have the whole 2nd half of the chicken pasture all to themselves. The day's lesson in foraging started as soon as they got over the shock of the short move to their new zipcode. "Soooo...." I said. "I think the best way to move the hen and her chick to their new home is for one of us to grab the hen and the other the chick. What do you think?" 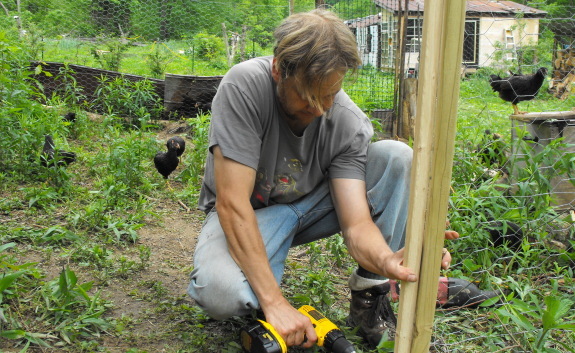 Mark had finished building a protected nook in the fenced off portion of the chicken pasture, and we were dying to get the chick to its new home. The brood coop was damp and stinky, both from accumulated poop and from the ten eggs that didn't hatch (ticking time bombs, just waiting for a wrong move to send waves of rotten egg scent through the farm.) 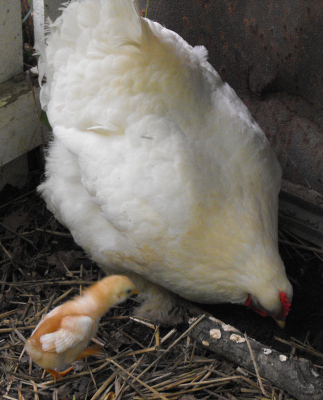 But the mother hen is pretty intimidating and I was, frankly, a bit afraid to grab her. "I'll get the hen," said my brave husband, donning his gloves. 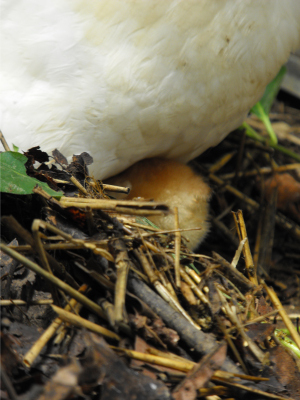 And he did --- one minute later, the squawking bundle of white feathers was being deposited into the chicken pasture. The trouble was, I couldn't catch the chick. It was just too fast for me, slipping in and out of the brood coop, then fleeing in fright into our barn. I went in after it, trying to tease it out of a stall full of old boards, until Mark called a halt to the proceedings. "Just wait a minute and see where it is," he admonished me. We waited, and seconds later, the fuzzball reappeared. "Mom! Mom! Where are you?!" it cheeped desperately. "Cluck, cluck, over here," she replied from across the yard. We stepped back, and the chick sprang forward. "Mom! Mom!" it exclaimed as it scaled the plum's raised bed. "Mom! Mom!" as it trotted through the blackberries. "Mom! Mom!" as it crossed the driveway, its mother now in sight. 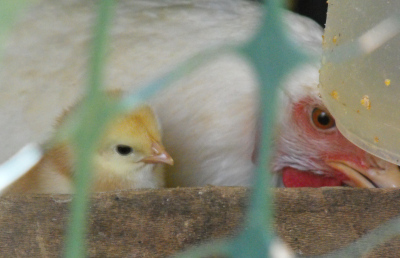 "Well, get in here," the mother clucked soothingly, and her adoptee slipped through the chicken wire to be reunited at last. Our homemade chicken waterer keeps brood nests dry and hens hydrated. I think we've finally found a product that will help Lucy figure out that she's not allowed to steal food scraps from the chicken pasture. Just minutes after the new chick made it back to mamma Lucy went sniffing around the fresh chick trail. It didn't take her long to follow it to the chicken pasture. 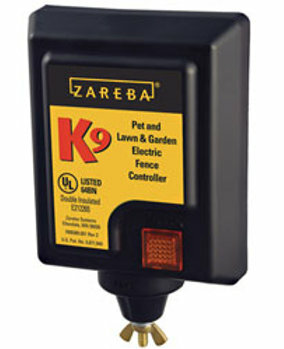 I just happen to be watching when she got too close to the Zereba K9 lawn and garden electric fence controller. The backward leap she made seemed to break a few laws of doggie physics. It's easy to set up. Just wrap each end of the perimeter wire onto the wing nut at the bottom. It uses something called direct discharge technology which eliminates the need for a grounding rod. With a maximum range of 1500 feet the K9 electric charger makes an excellent solution to keeping unwanted pets out of sensitive areas. Expect to pay about 25 bucks for the unit and maybe another 20 to 200 depending on how long of a perimeter you're protecting and the quality and quantity of the fence posts used. We headed to the hive Thursday to steal some honey, but ended up deciding to wait another week. Although there's plenty of honey present, I couldn't find a single frame that was completely capped. Capped honey can be stored indefinitely since it's so low in moisture that microorganisms can't get a foothold in the gooey goodness. Uncapped honey, on the other hand, can host several yeasts that ferment the honey, slowly turning the precious sweetener into mead. You can get away with extracting frames with a bit of uncapped honey, but I decided to play it safe. The last week has been cool and wet, so I'm not really surprised our bees sat around playing poker instead of making and capping honey. Hopefully next week we can take our borrowed extractor for a spin. Moisture's bad in honey, but good in the chicken coop. 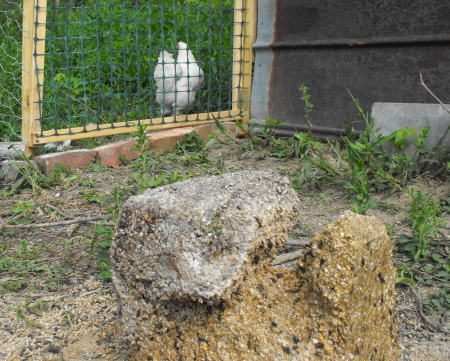 Promote your chickens' health with a homemade chicken waterer. I estimate the total cost of the chicken pasture electric fence installation to be around 75 dollars which ended up including the following items. Each bag of insulators comes with enough nails, but I prefer using drywall screws because it makes adjustments easier after you've got it all together. I've been dutifully plucking asparagus beetles and squashing eggs once a week, hoping that a predator will show up soon and take over. By now, the eggs I missed have given way to plump larvae nibbling on asparagus fronds, so I was thrilled to suddenly notice half a dozen insects I'm unfamiliar with sharing the habitat. Could this be my long-awaited pest control? Sadly, no. The new bugs are just some of the seemingly unlimited supply of different native pollinators in our garden, these attracted to the just opened asparagus blooms. 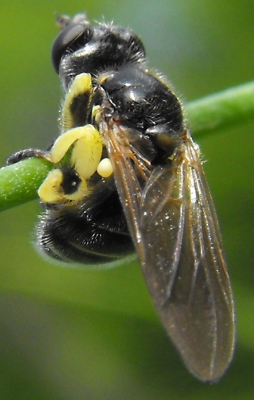 The scary looking guy at the top of the page is a Syrphid Fly (aka Hover Fly) that feeds on nectar as an adult and on moist organic debris as a larva. The strange percher on the right is a Thick-headed Fly taking a break from a snack of nectar before she lays her eggs on a bumblebee or wasp in flight. 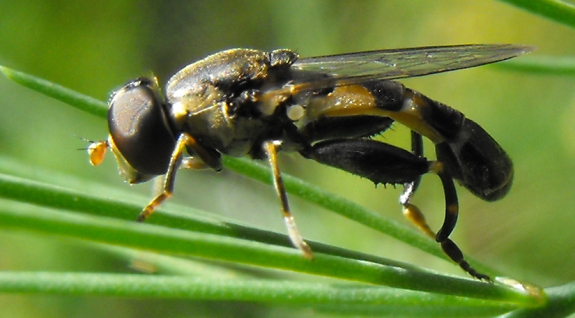 I'm still rooting for a predacious wasp, but until I see one I'll keep squashing beetle larvae. I hope you'll bear with a second lunchtime series of experimentation. If you're bored, say so and I'll try to cut back on future lunchtime series about experiments. Meanwhile, I've got a book-related series on comfrey coming up, so stay tuned. 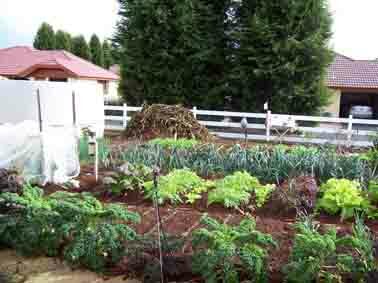 Last summer when the blight hit, I was faced with several empty beds in August. Even though it was a bit late for planting most fall crops, I decided to seed carrots and parsnips, and the umbellifers did grow beautiful ferny leaves to replace the blighted tomatoes. However, when cold weather approached, I had to face the fact that my crops hadn't been in the ground long enough to thicken their roots, so I decided to cover them up with mulch and see what would happen in the spring. I uncovered the carrots and parsnips at the same time I uncovered the strawberries, and the plants took off, once again turning their beds into a jungle of leaves. I was so hopeful...until I pulled a few up. 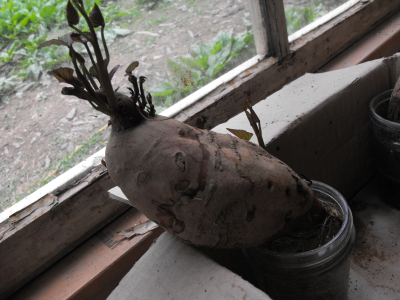 The parsnip roots had gone woody inside while the carrots had paled in color and turned bitter. They were just barely edible enough to use in soup, but I would have been better off eating the small roots last fall when they were sweet and crunchy. 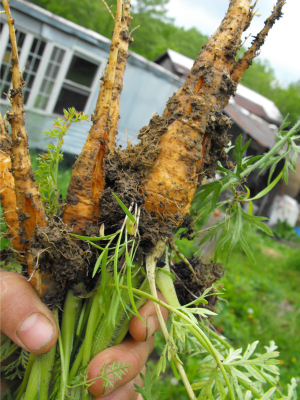 I haven't gotten around to pulling all of the parsnips out yet, and they're starting to send up flower stalks --- the one positive result of overwintering a biennial. I don't know if I have enough plants to prevent inbreeding, but I'll at least let them bloom since umbellifer flowers are beloved by beneficial insects. And if I need something to fill garden gaps in August, I'll stick to a late planting of summer squash. Want to know how we can afford to spend so much time gardening and blogging? Our Microbusiness Independence ebook shows you how to follow in our footsteps. When I first discovered that I'd ordered the wrong flywheel puller I had a brief fantasy of fabricating one of my own to get the job done. I never could figure out a decent direction to go in and decided to give up on it for a while and just mow with the semi un-balanced blade. Well some guy with an interesting blog named Ed had a bit more gumption than I did and almost made his own diy flywheel puller tool pictured here. He reports the wood breaking before the flywheel came free, which is a bummer. The way he finally solved the problem was to take it to a local shop where they used the crude but effective hammer and screwdriver approach to pop it off. I'm starting to wonder if anybody out there uses these flywheel puller tools for the basic small to medium lawn mower engine? 1. Fruit that makes it into the house to be shared with the long-suffering husband after the primary gardener has glutted herself for two weeks on sun-warmed strawberries. Origin: Previously considered an erroneous combination of "leftover" and "strawberry". Added to the dictionary in 2009 when excess rain caused a decline in flavor. Despite full flavor in 2010, the phrase has been retained. It's been months since I've talked about our do-nothing grain experiment, but what can I say, I've been doing nothing. You may recall that I let the chickens churn up a couple of areas in the yard, then threw down hull-less oat and red clover seeds in early March. 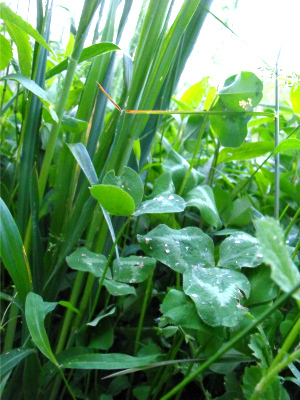 For a while, the weeds seemed to be growing faster than the grain and clover, so I figured the experiment was a failure. I mowed down one plot accidentally, but remembered to mark off the other small plot with cinderblocks. And suddenly the oats have overtopped everything else and the clover is starting to outcompete the weeds. This is all with no tilling, no kill mulch, and no weeding. Granted, this first incarnation has too many flaws to be considered a success. 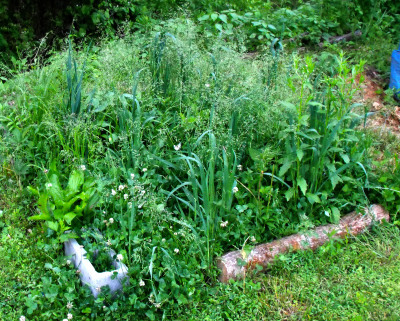 There are only about a dozen oat plants in my three foot by three foot plot, presumably because I didn't cover the seeds with anything and hungry critters made off with most of them. Fukuoka prevented this predation by wrapping the seeds in balls of clay, but I suspect just raking them into the soil a bit better or covering them with straw might do the trick. There are also plenty of weeds mixed into the plot, but I consider this less of a problem. The clover and oats are clearly doing better than the weeds, and I think a few generations of do-nothing gardening might clear out the unwanted visitors in the plot. I'm gearing up for a second do-nothing grain experiment shortly, using the buckwheat/wheat rotation that seems better adapted to our climate. Mark fenced our cockerels out of two thirds of the chicken pasture last week, and the flock is finally starting to denude their remaining space. In a few weeks, we'll rotate the chickens out, rake up the ground, and sow some buckwheat and clover seeds for do-nothing experiment part two. Turn your invention into a homestead salary. 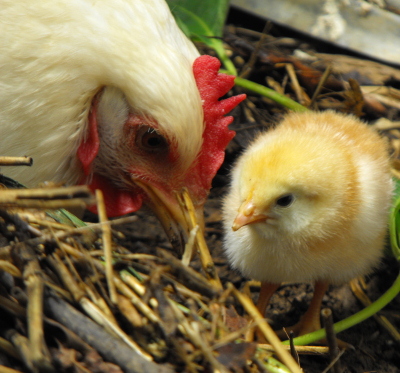 Cute baby chick + protective mother hen = Warm fuzzy feeling. I live in N.E. Ohio and we get almost the same type of weather that you and Mark get (not quite as hot), except we get the lake Erie effect, so that means more clouds, and a quick change in weather. I was just wondering what you do for hot humid weather. First of all, we're really lucky to live out in the country where the trees mitigate a lot of the heat. Even though our trailer isn't shaded (nor insulated nearly as well as Zimmy's), it cools off enough at night that open windows and a fan are all I need even in the peak of summer. In the city where I spent part of my childhood (just an hour down the road from our current farm), asphalt collected the heat and we weren't nearly so lucky. The cool nights definitely help! We also tweak our daily schedule to work around the weather. In the winter, we spend the mornings indoors working on blog posts, chicken waterer construction, or fixing things, then do our outside chores in the afternoon when the sun has had a bit of time to warm the day. I feel like summer has really begun when we flip-flop that winter schedule, working outdoors in the morning when night's cool temperatures are still around to mitigate the heat, then coming inside for the afternoon. On the other hand, I don't know if Mark's body could acclimate to the heat the way mine does. I was raised without major climate control --- we kept the house temperatures cool in the winter and had no air conditioner in the summer (though I often walked to the library to bask in their cool temperatures.) Did early exposure to temperature extremes adapt my body to the warm blanket of humidity in ways Mark's body could never adapt? I seem to need less heat in the winter too, although I think that's partly because I have no problem wearing long johns and a winter coat, if necessary, even in the house. I'd love to hear from you about your body's ability to acclimate to hot and cold. Are you the one always turning the thermostat up, or always turning it down? Were you raised in climate-controlled splendor, or jumping in the creek to cool off on a hot summer's day? Bonus points to anyone who can point me to some serious science about what happens when our bodies get used to hot weather. 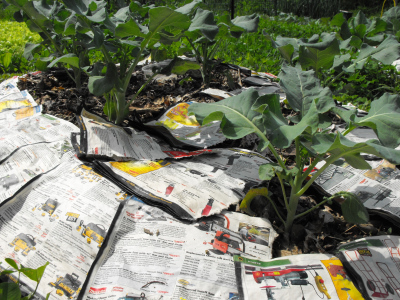 Last week, I detailed the results of my first summer mulch experiment, noting that cardboard is a potential winner. Meanwhile, Mom found a stash of huge boxes being thrown away and snagged them for my continuing mulch experiments. I'm trying the cardboard out on some cucurbits and okra, as well as on two troublesome, weedy beds that need a kill mulch. Sister cucurbit and okra beds are being left bare for comparison. 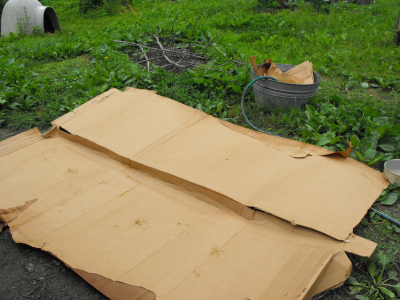 Despite the fact that I soak the cardboard well before using it as a mulch, I'm a bit concerned that it might be too slick for easy rain penetration. 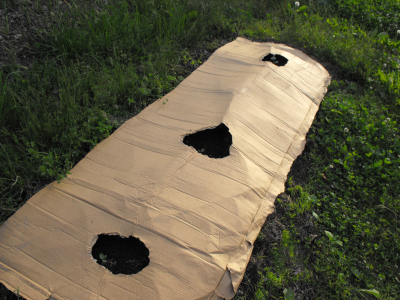 I'll keep a close eye on the cardboard-mulched plants and perhaps add some organic matter on top of the cardboard or punch small holes in it to increase water penetration. As Mark pointed out, if I can work the kinks out of cardboard mulch, there's a neverending supply in nearby towns and it's much easier to transport than other mulches. In other mulch news, last year's newly transplanted comfrey patches are now big enough that I'm cutting them biweekly, adding the low C:N mulch to select garden beds. So far, comfrey seems to be equivalent to grass clippings as a mulch --- providing fertilizing power, breaking down quickly, but letting some weeds through. I have to mention that the bumblebees continued to feed from the cut flowers for over 24 hours after they were detached. 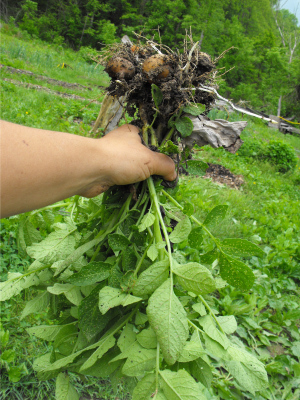 Another reason to plant comfrey in your yard...as if you don't have enough reason already! Quit your job and follow your dreams. Working on a tip I got from the local hardware store last week I went out this morning in search of the Flywheel Wizard. I was not only lucky enough to see him without an appointment but was able to record the short sequence of events that needs to transpire before the flywheel will finally yield its secrets. It was a father and son team, and I asked them about flywheel puller tools. It seems they both agree that a special tool is needed if you're an amateur, but if you perform each step with care the old pry bar and hammer trick will work without doing any damage. someone to help apply pressure to opposite side. The flywheel nut should be positioned at the very top of the flywheel shaft so it will receive the brunt of the hammer pounding which helps to protect the flywheel shaft threads. 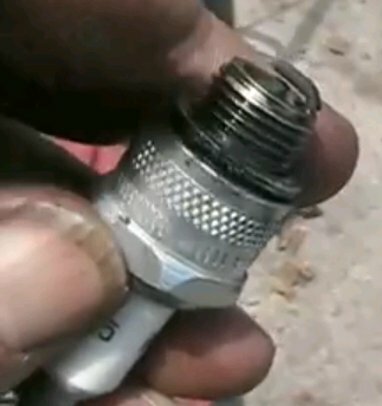 What you don't see in the short video is the flywheel nut being replaced due to something going wrong. I suspect he should have had his Dad pulling since the first hammer hit. The Wizard only charged 18 bucks and had me on my way within minutes. Garlic is on my list of crops so easy I barely post about them. I'll mention curing in a month or so since that was our downfall last year --- we lost nearly a third of our crop due to improper drying. Other than that, timing is the only concern. Specifically, when do you harvest garlic? If you harvest your garlic too early, the heads will be small, and some may not have divided themselves into cloves yet. If you harvest your garlic too late, the outer wrapper layers will have rotted off and the garlic head won't store well. We're looking for Goldilocks' "just right" stage, when the heads have achieved their full maturity but are still enfolded by several protective layers of paper. 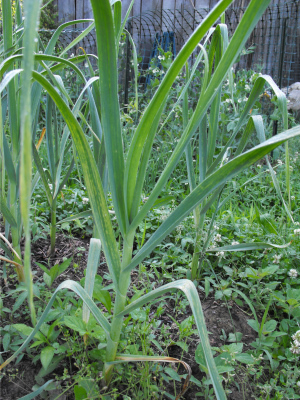 A rule of thumb is to harvest when the lower leaves of the garlic plant start to die back but four to six living leaves remain. 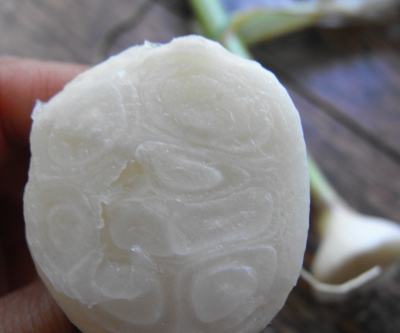 Folks say that each living leaf equates to a wrapper layer still encasing the garlic head. Depending on where you live and what type of garlic you're growing, the magic date may arrive any time between June and August. I planted so many beds of garlic this year that I can afford to harvest a few early to get a feel for what's going on underground. Monday, I pulled the plant at the top of the page and cut open the bulb to see what's inside. Notice the eight living leaves still on the plant, but only seemingly three or four protective layers around the head. I could probably harvest the garlic now, but I'd rather let the plants grow for another week or two, testing at intervals to discover when the outer layers begin to rot off. We've still got thirteen heads of garlic from last year to eat up, so I'm in no big hurry to harvest. I do wonder, though --- what was I thinking to plant twice as much garlic as last year? Christmas presents? Fear of vampires? 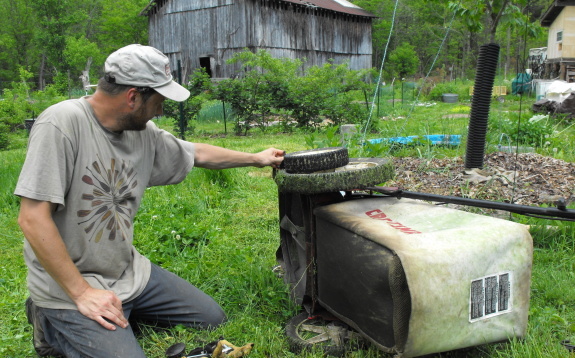 Check out Mark's best known homestead innovation --- his POOP-free, homemade chicken waterer. 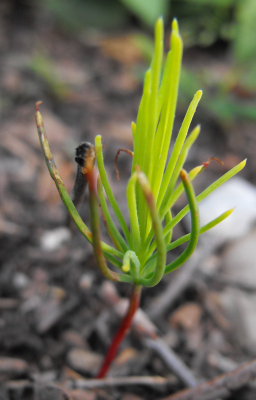 Is that a baby stone pine? Hmm, I don't know. What do you think? 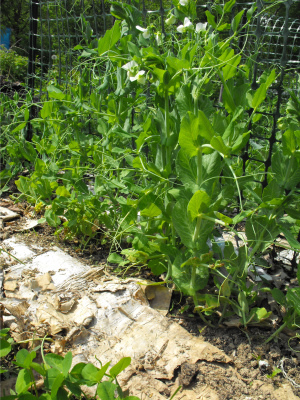 The problem with my stratification method --- toss the seeds in a garden bed and wait over the winter --- has become clear. I very rarely mark anything in the garden because I write down which bed I've planted seeds in and I know how to distinguish vegetable seedlings from weed seedlings. But what do you do when you've planted seeds that will turn into unknown seedlings, like the stone pine, honey locust, and persimmon seeds I popped into the garden to stratify this winter? By definition, these guys need extensive time in the ground before they'll sprout, which means I've been scared to weed those beds for the last six months in fear I'll pull out my tree seedlings. Now I'm left wondering whether a few odd seedlings are the ones I've been waiting for, or whether my carefully collected seeds came up and choked amid the weed patch. I can't believe I'm saying this, but winter sowing would have come in handy here. That's actually how I started my first persimmon seeds --- I popped them in a pot of soil and forgot about them until seedlings miraculously sprang up many months later. Maybe I'm going to have to start this experiment over next year, keeping better track of where my slow-to-germinate seedlings are located? A string of failures is the key to many successes. Why not learn from our trial and error process rather then repeating our mistakes? Microbusiness Independence walks you through starting a small business that will pay all of your bills in just a few hours a week. 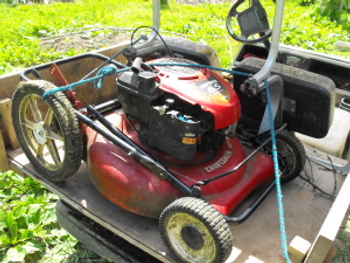 Now it's so easy to start the mower even Huckleberry could do it. I started to write that this is the year of the broccoli, then stopped myself. After all, it's only May. Who knows what bounty the garden year will bring? Plenty of broccoli, that's for sure. We've eaten three medium heads, and I'm eying this huge one as it continues to swell larger and larger every day. 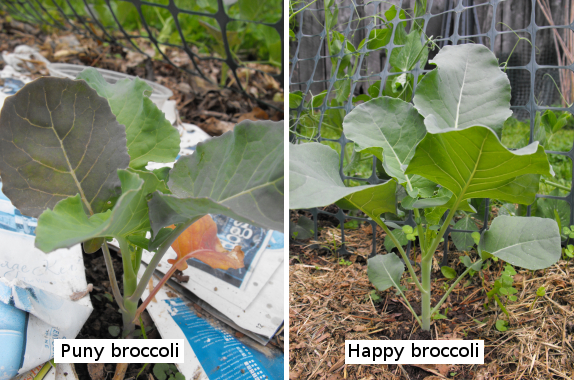 Six and a half beds are devoted purely to broccoli this spring, and I also slipped in a few plants amid the peas and garlic. 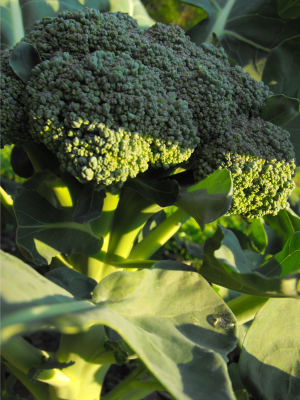 The varied planting dates this spring due to frost damage mean that our broccoli will ripen over a few weeks rather than all at once, which is all to the good. But already I'm considering packing some away in the freezer, along with the greens that have finally outgrown our appetites. 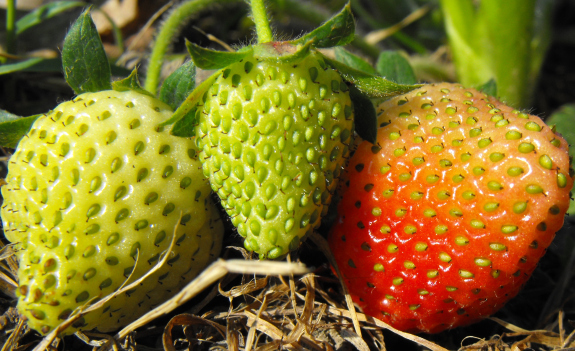 We're eating sugar snap and snow peas too, and I spent the whole week working in the upper garden so that I could lean down and nab a juicy strawberry whenever the fancy struck. On the other hand, the last of the lettuce is turning bitter, slated to be torn out and replaced with summer crops shortly. The first set of beans is nearly ready to bloom, a few tomato plants sport flower buds, and cucurbits seem to double in size every day. The garden wheel has turned from spring to summer and our stomachs are full. Share the bounty with your chickens. Our homemade chicken waterer keeps chickens healthy and happy. 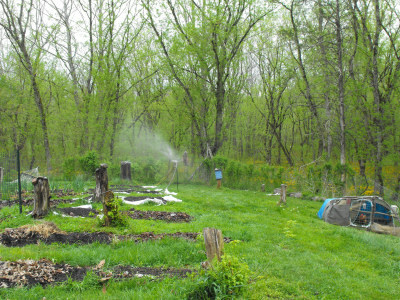 Over the last year and a half, we've been experimenting with three different forest gardens. 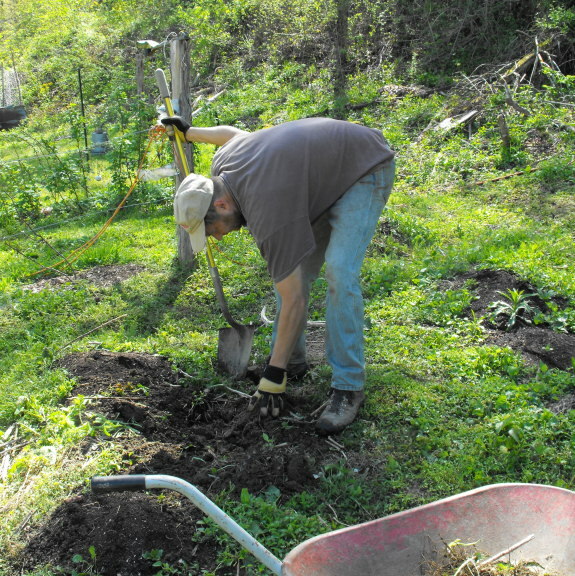 My ambitious plan to turn the nectarine-plum-apple area in front of the barn into a forest garden in one fell swoop has been going as slow as molasses --- I've mostly been spreading comfrey around for fertility and building a few mounds here and there to raise plants' roots out of the waterlogged soil. My low maintenance plan to subtly tweak a nearby area of young woods to encourage edibles and nectaries is in the growing stage, with little active management needed. The star of the forest gardening has been my third variation on the theme --- a little forest garden island outside the kitchen window, an area that receives our concerted attention twice a day as we gaze out the window while eating meals. As a result, I'm often reminded to spend two minutes pulling weeds or raking back the mulch to throw some flower seeds on the ground, and the result is a mass of color and fertility that the central peach seems to enjoy. While the concept of creating a forest garden whole cloth seems pretty daunting, slowly expanding a forest garden island has turned out to be easy and fun. A heavy leaf mulch on the compost mounds from last year resulted in a weed-free area to sow cosmos, marigolds, zinnias, and other easy flowers this spring. 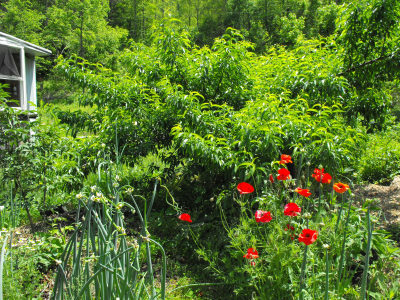 The self-seeded poppies I transplanted out of the vegetable garden last year are now in full bloom and the extra Egyptian onion bulblets I tossed beside them are in just the right spot to make it easy to snip a few leaves for our dinner. 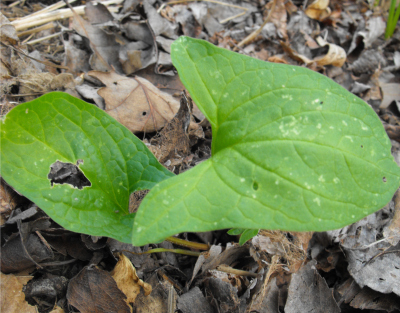 I snuck in a few Good King Henry plants --- a perennial green that will bear in partial shade --- and randomly poked some giant pumpkin seeds into the ground. Underneath the peach's canopy, comfrey continues to grow in the shade, ready to be cut back to feed the tree's roots. A mass of wood chips innoculated with King Stropharia spawn gives me an easy spot to sit and enjoy the view of swelling peaches. In my nook under the peach, I feel like I'm immersed in the woods, but with edibles and flowers within reach. No wonder our visiting songbirds like to perch in the peach's branches before flying out into the vegetable garden in search of bugs. If you're intrigued by the idea of forest gardening, but are daunted by the extensive planning and initial work load, I highly recommend starting with a little forest garden island. A few minutes' play can turn that tree in your yard into the cornerstone of a vibrant ecosystem, feeding you and the local wildlife. As the tree grows, so will the understory, and soon you'll have plenty of perennials to spread under the enlarged canopy. Escape the cubicle with Microbusiness Independence. 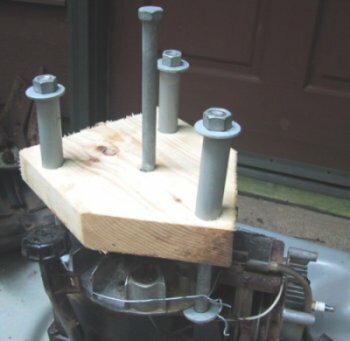 Need clear instructions on how a Briggs and Stratton engine really works? Davidsfarm channel on YouTube does a great job at distilling down years of experience into minutes. I appreciate David's simple approach to DIY videos and feel like I've already learned a thing or two from watching what I've seen so far. Yes, this is another gratuitous strawberry photo. I may have to rename this The Strawberry Blog if I don't pull my attention elsewhere soon. But aren't three quarts of strawberries at one picking pretty awesome? In the interest of at least pretending like this post imparts useful information, here's your strawberry tip of the day. 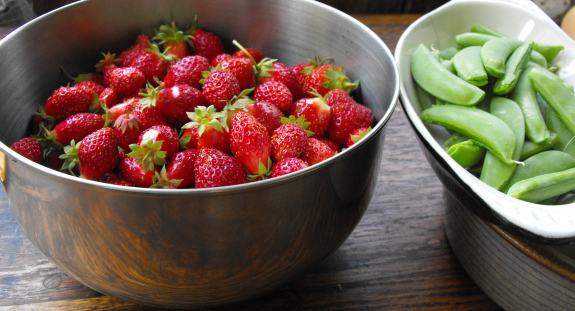 For maximum sweetness, pick fruits before you water and wait at least 24 hours to pick again. Try to time your harvest to the sun --- bright, hot days churn out sensational berries. Since I wanted to water the front garden Friday, I picked every berry that was ripe or nearly ripe. One quart went into our bellies whole for lunch (along with the sugar snap peas shown here); one quart was sliced, lightly sprinkled with sugar, then topped with whipped cream for supper; and the final quart is going to my mother today. Only mothers are high enough up in our esteem to merit gifts of strawberries --- I don't want you to think we're giving them away because we're sick of them! 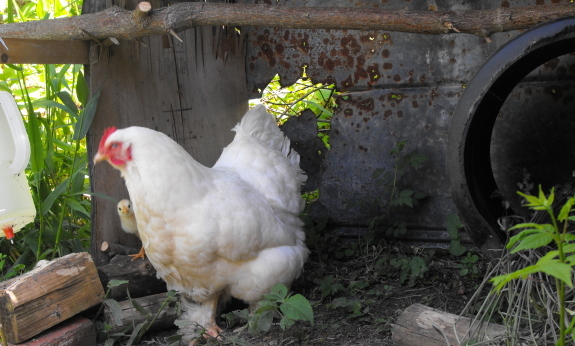 Our homemade chicken waterer helps prevent coccidiosis, especially in tender, young chicks. My brother in-law was smart enough to buy a Little Giant type ladder years ago and I'm glad he did. 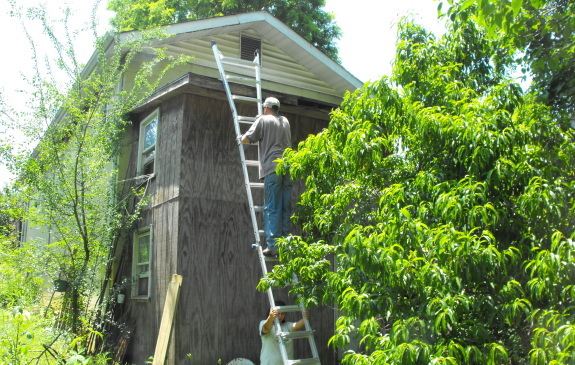 It helped this small home improvement project be a bit safer and smoother than a neighbor's older ladder which wasn't quite long enough. I've always thought the old standard extension ladder was overdue for a make over and this is one of those times when the engineers got it right. You can find them in a wide variety of sizes and shapes. The big plus is how compact this thing folds down to. Harold Ray Wing discovered the first prototype in Germany back in the 1970s. He came back home to Utah, got a U.S. patent, started building them in his garage and selling them at trade shows and the rest is what they call ladder history. Photo credit goes to Maggie Hess for capturing this Little Giant Chinese knockoff in all its long and sturdy glory. I wonder how much of a percentage Harold got from this big box store deal as the original patent holder? 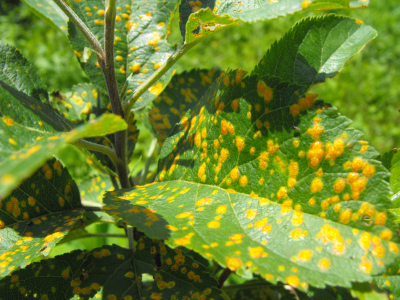 Cedar apple rust has struck again. This winter, we cut down dozens of nearby Red Cedars, but we only girdled the ones that were too close to the electric line for easy felling. The girdled trees are taking their own sweet time to die, so they were able to transmit the fungus to our fruit trees yet again. These orange spots are a sure sign that our trees are infected. This means another year of malingering, although I hope by next year we will have wiped out the closest Red Cedars and our apple trees will finally take off. To be fair, not all of our apple trees are malingering. I've noticed quite a range of sensitivies, from the Winter Banana and Stayman Winesap, which would just as soon not do anything as long as the rust is in the air, to our Virginia Beauty and Early Transparent, which are growing quite happily with just a few small spots speckling their leaves. If cutting the nearest cedars doesn't bring relief to our apples, I'm not going to have Mark fell all of the cedars on our property --- there are just too many. 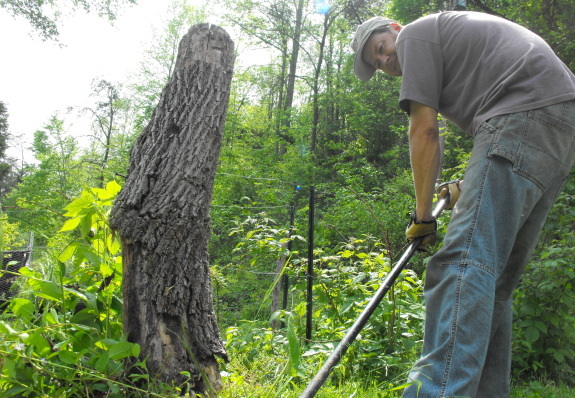 Instead, I'll take a permaculture approach and replace our susceptible trees with resistant ones. For example, old fashioned Winesaps are resistant to cedar apple rust, while Stayman Winesaps are not. The best list of resistant species I've run across is in this pdf file from the Arkansas Extension Service, unique in that it includes heirloom species as well as those specifically bred to be disease resistant. In our neck of the woods, where Red Cedars are a very common early successional tree, it probably would have made sense to only plant resistant varieties in the first place. Our homemade chicken waterers never spill or fill will poop. If you had chickens 100 years ago in America you would've most likely used a hand cranked corn sheller every day to keep your flock fed. Thanks to Global Cycle Solutions now you can give your hand a rest and get all your corn shelling done with pedal power. The device can be unattatched so you can operate the bike for transportation or hook up another clever gadget to charge your mobile phone or flashlight or whatever else you can imagine that needs a little power. The cost is 60 dollars plus shipping which seems like a bargain. Our movie star neighbor had noticed a lot of bees hanging around on the front of the hive, which led him to believe they might be getting ready to swarm. Since he had to leave town for the weekend, he asked if we could drop by and check on the apiary. We were more than happy to oblige. I didn't notice any swarm activity, although I did see some bees sitting around on the front wall of one hive. I've seen this on my own hives in the past, and at first was terrified it meant I'd missed the boat and let a hive reach swarming stage. But each time, the bees hanging out on the sidewall just turned out to be a new batch of worker bees, getting used to the great outdoors. A day or so after the sitting stage, they reach the aimless flight stage, and the next day the hive is back to normal, just with yet more workers flying in and out. I'm hopeful our neighbor will come home to happy, productive hives. Our movie star neighbor is also the one who got us started on chickens leading to our homemade chicken waterer. Thanks, Frankie! Books in the popular press about permaculture are quick to sing comfrey's praises, but they are much slower to give any practical advice about how to use the wonder plant. When I discovered that an entire book was written about comfrey in 1953, and that it can be downloaded for free from the Soil and Health library, I had to check it out. 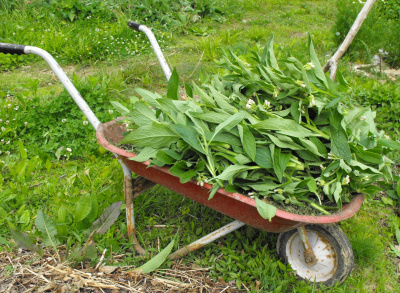 Lawrence D. Hills' Russian Comfrey: A Hundred Tons an Acre of Stock Feed or Compost for Farm, Garden or Smallholding details the history and uses of comfrey from a British perspective. 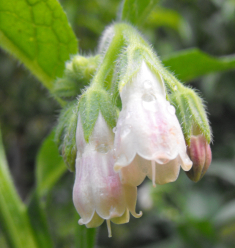 I was surprised to read that comfrey has been used for over two hundred years in the United Kingdom, where the plant is praised for the high protein content of the leaves and for its prolific growth. One farmer planted a quarter of an acre of comfrey, which provided feed for three cows and two horses, while others feed comfrey to poultry and pigs. 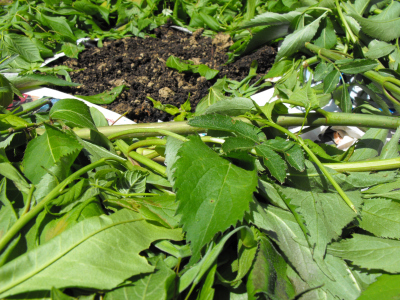 The same qualities make comfrey a great crop to create copious compost or compost tea. So, what's the deal? Is comfrey worth its salt? How should it be grown and used? Stay tuned to hear the answers in this week's lunchtime series. I made the mistake of storing the flock block in a place where it could get wet, and about 1/5 of the top portion started to mold.